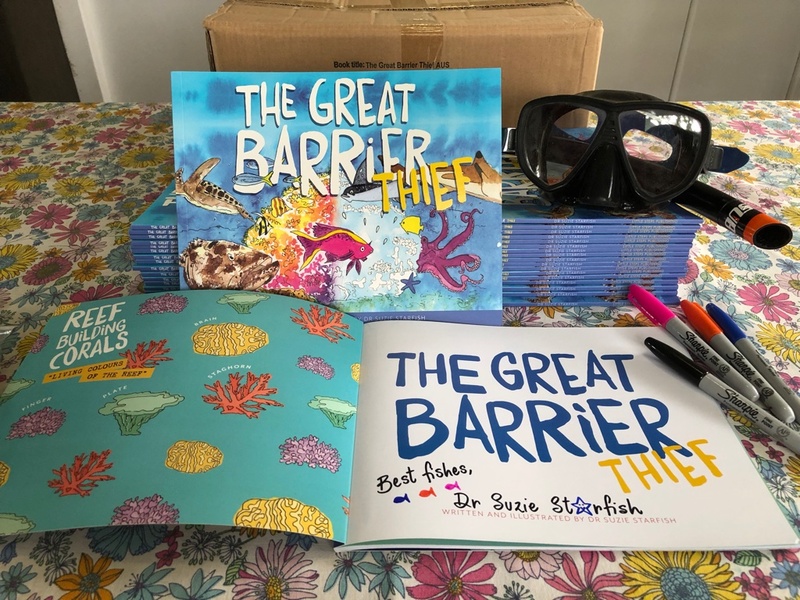 My first children’s picture book, “The Great Barrier Thief“, is written and illustrated by Dr Suzie Starfish (my alter ego) and illustrates the impacts of climate change on our Great Barrier Reef, the largest living structure on earth! This book is suitable for all ages with the focus on young readers from 4-10 years of age. 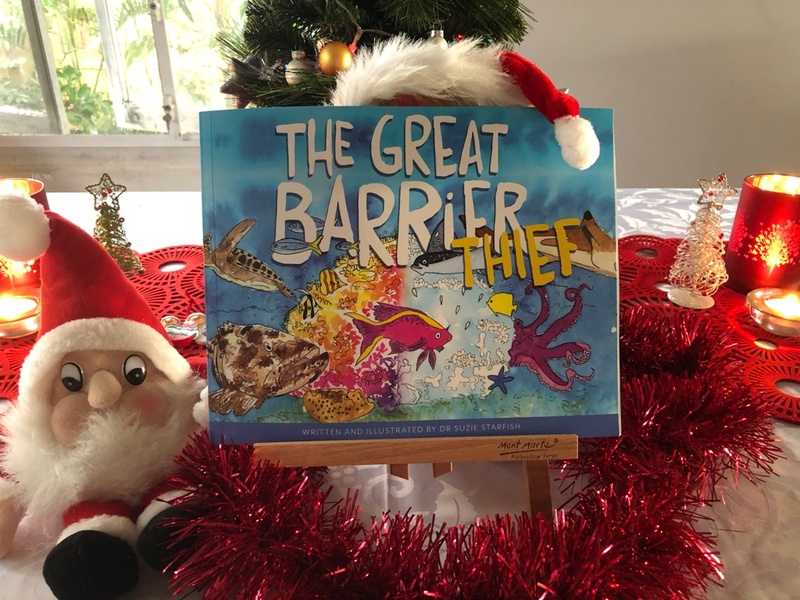 The book also offers messages of hope and how together WE can help protect and save the Reef by cooling things down right away. 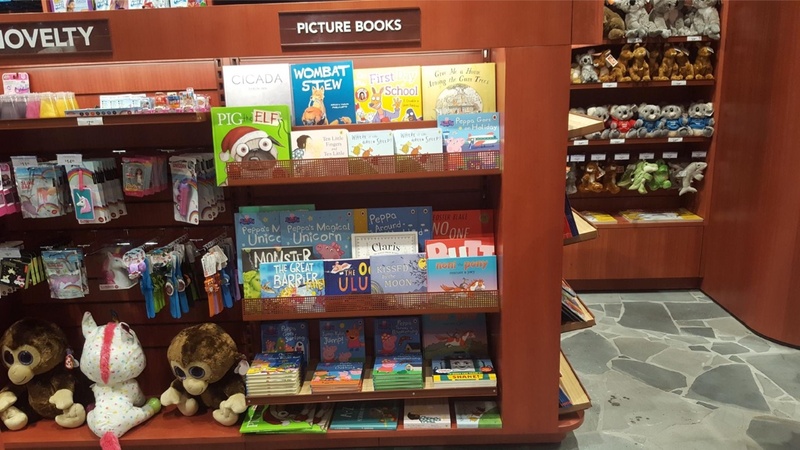 The books are available to purchase via the different payment options below, noting the order and shipping options differ for Australian/New Zealand addresses and other International addresses. For bulk orders of my book please Contact me directly to arrange orders and shipping. 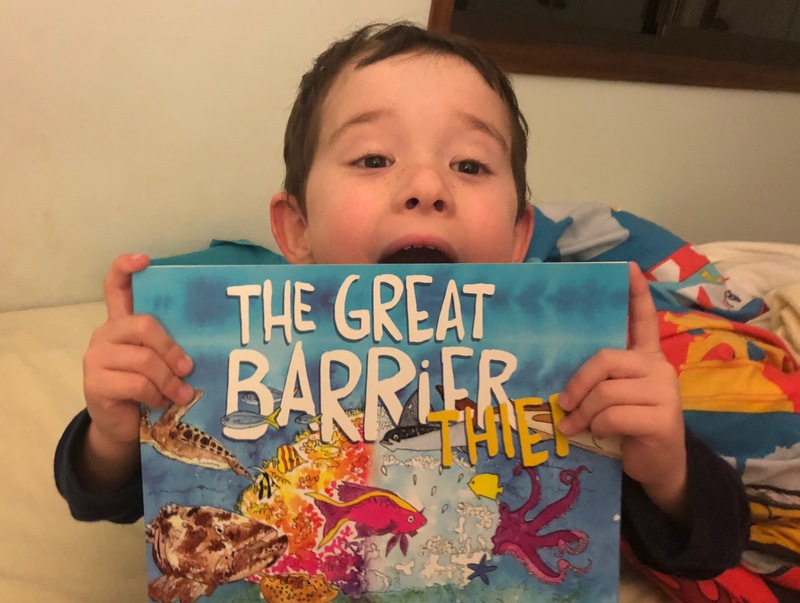 **Keep an eye on your email as I contact everyone who buys my book from my online bookstore to ‘sea’ if they want a signed copy and if you want me to address the book to yourself or special little ones in your life! 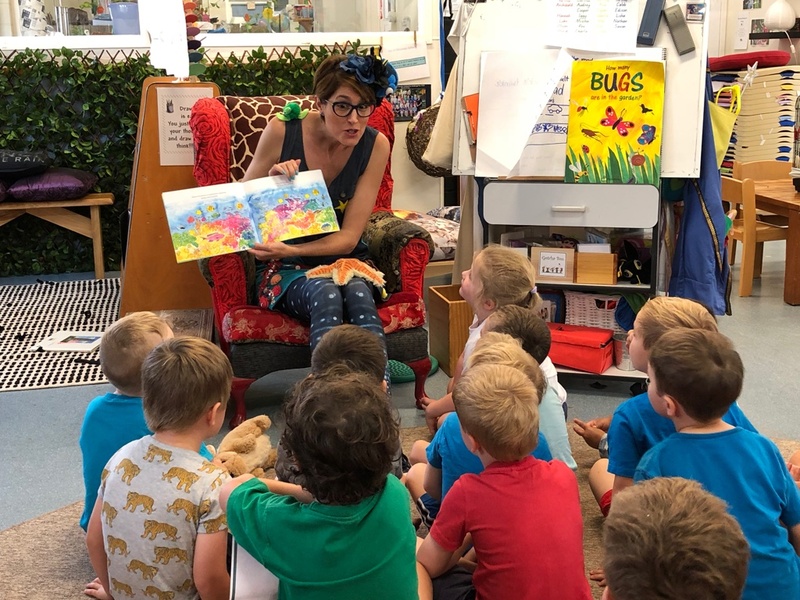 The story behind my story, book reviews and feedback and visits by Dr Suzie Starfish are outlined below. 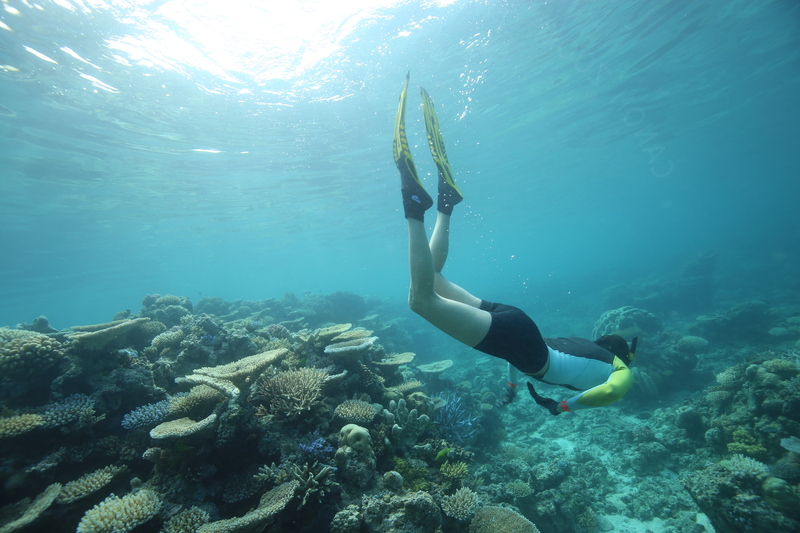 So please dive in with me to help draw attention to climate change and protect the reef. 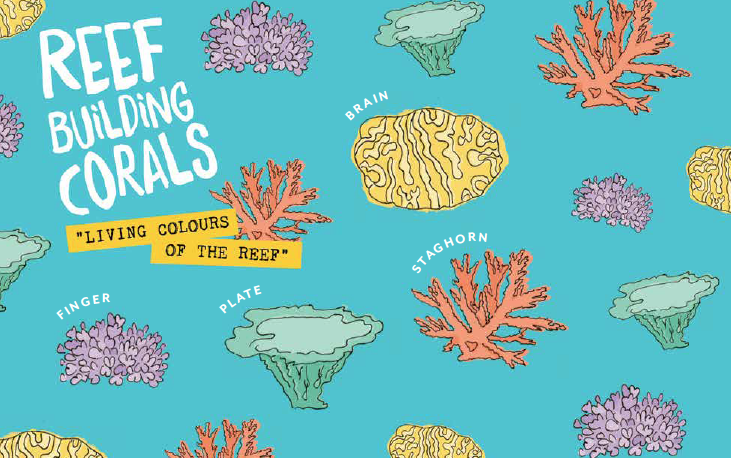 The “Great Barrier Thief” picture book is a GREAT teaching resource as the moment you open this book you dive into the fun and fascinating facts about our Great Barrier Reef, as shown below by one of the endpapers which teachers can use to illustrate the types of reef building corals, the “living colours of the reef”. 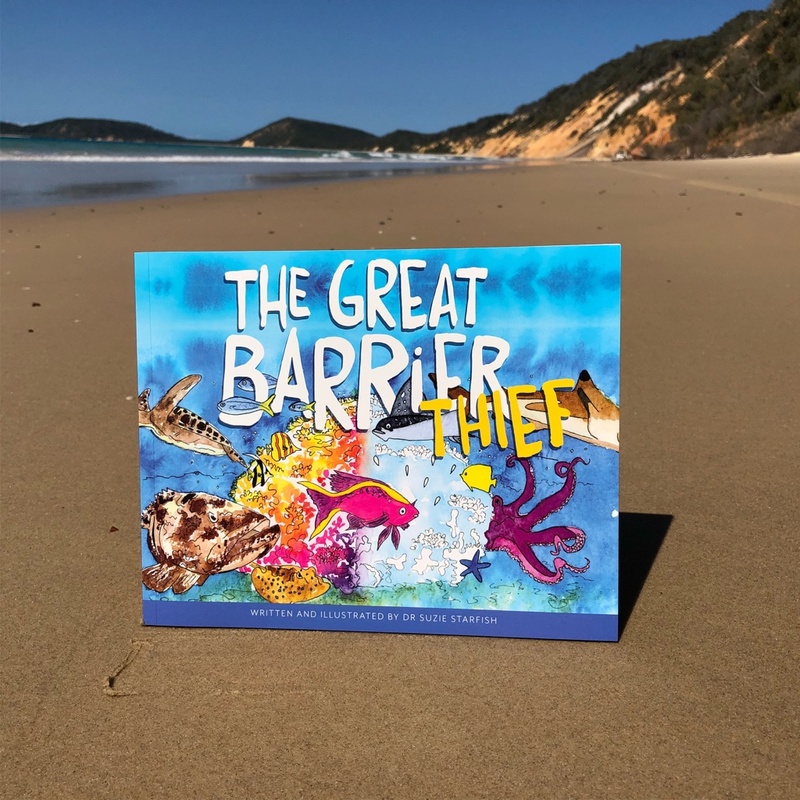 The story is based on marine science, covers a range of important environmental issues from the impacts of climate change to plastic pollution and provides messages of hope and solutions that each one of us can help protect the reef. 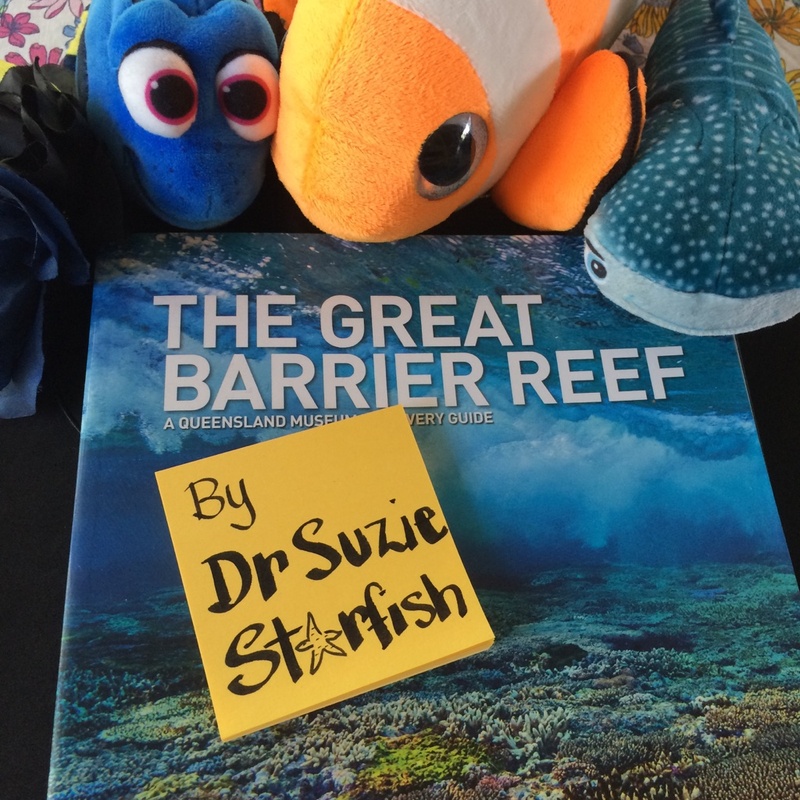 As soon as you open this book you will dive into the wonder and beauty of the Great Barrier Reef and ‘sea’ the “living colours of the reef“! 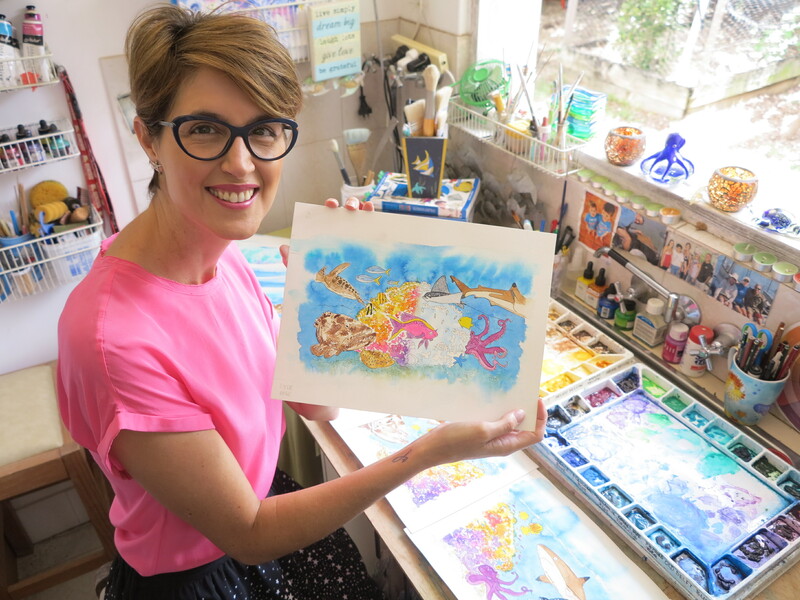 As part of the visit Kindy and Primary School students will enjoy colouring-in the living colours of the Great Barrier Reef with Dr Suzie Starfish as they chat about how they can help protect the Reef! 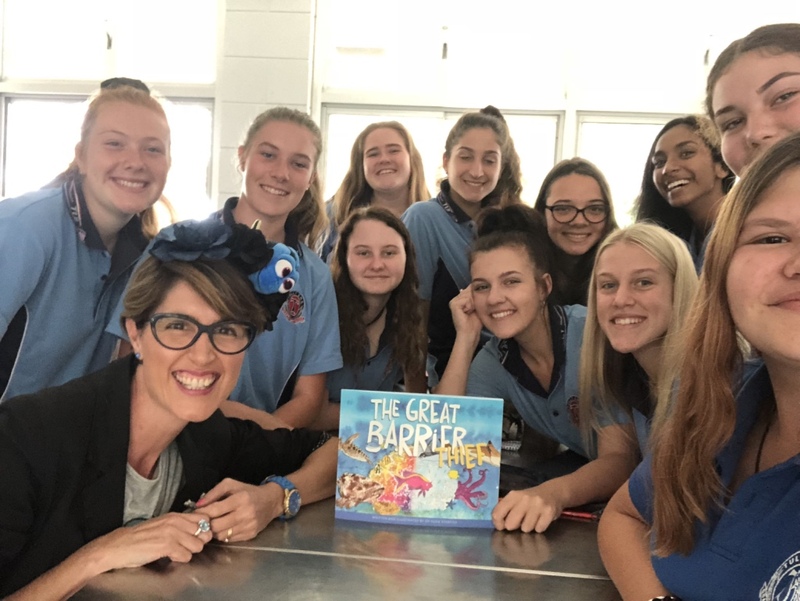 Discussing the impacts of climate change on our Great Barrier Reef with these amazing Year 10 science students in Far North Queensland just shows you are never too old to read picture books! 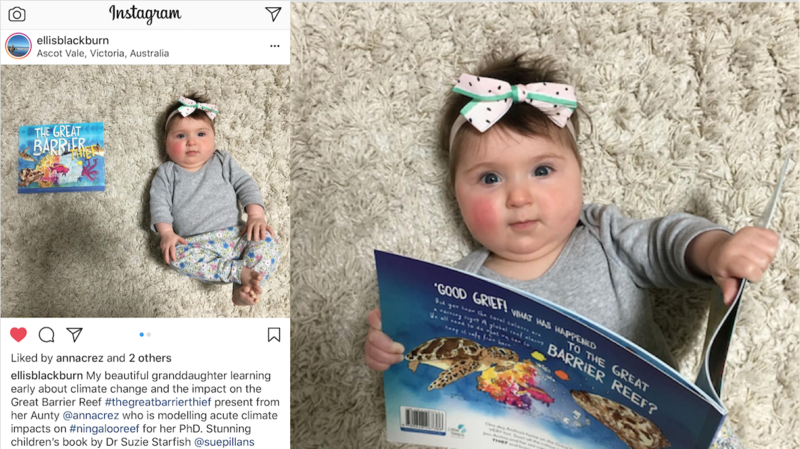 Storytelling engages people and picture books are unique in that they are able to illustrate ideas, issues and complex concepts through words and pictures, providing a talking point for us all… despite our age! 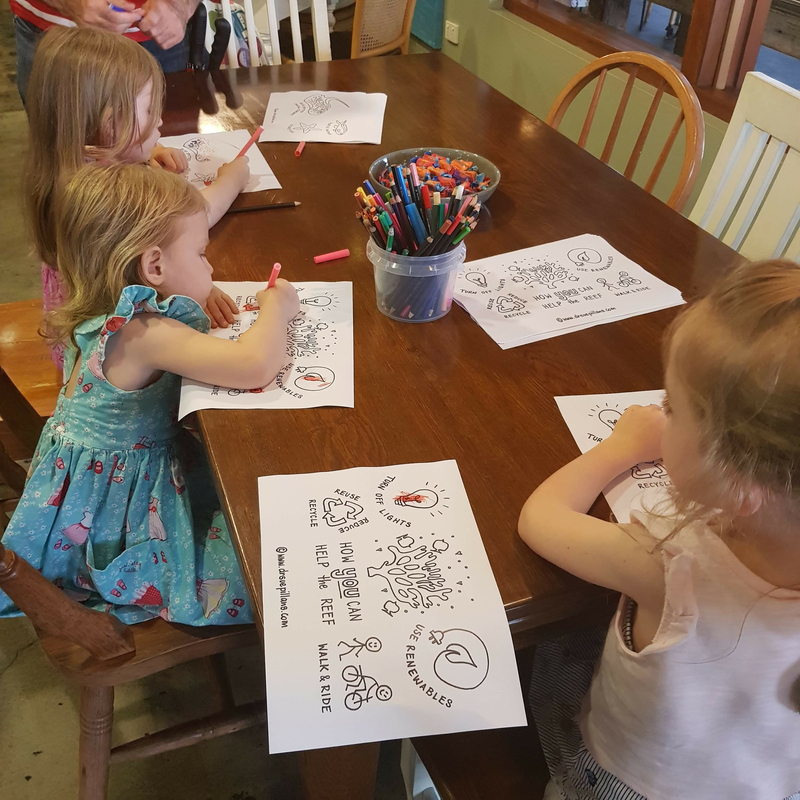 Drawing attention to climate change! 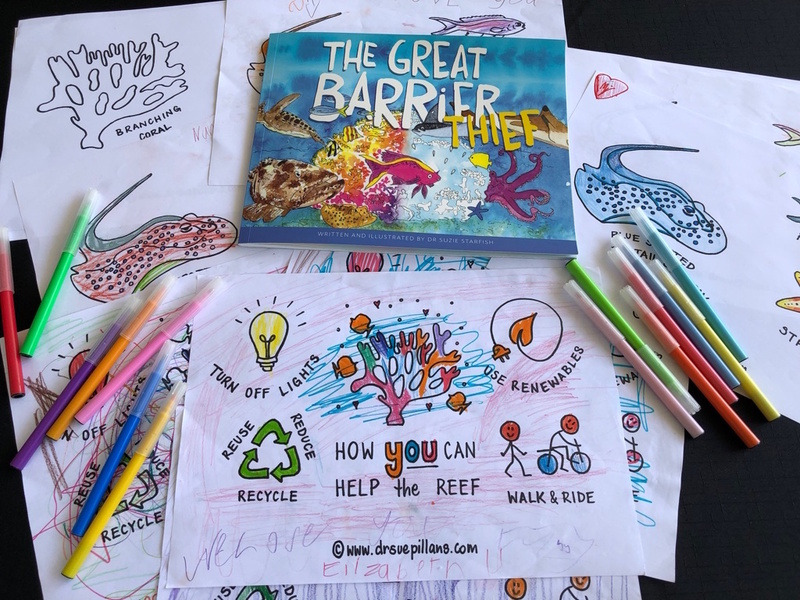 It’s never too early to ‘draw attention’ to the impacts of climate change as our future reef guardians, our children, need to ‘sea’ that they CAN help do something today to help the Great Barrier Reef for tomorrow. 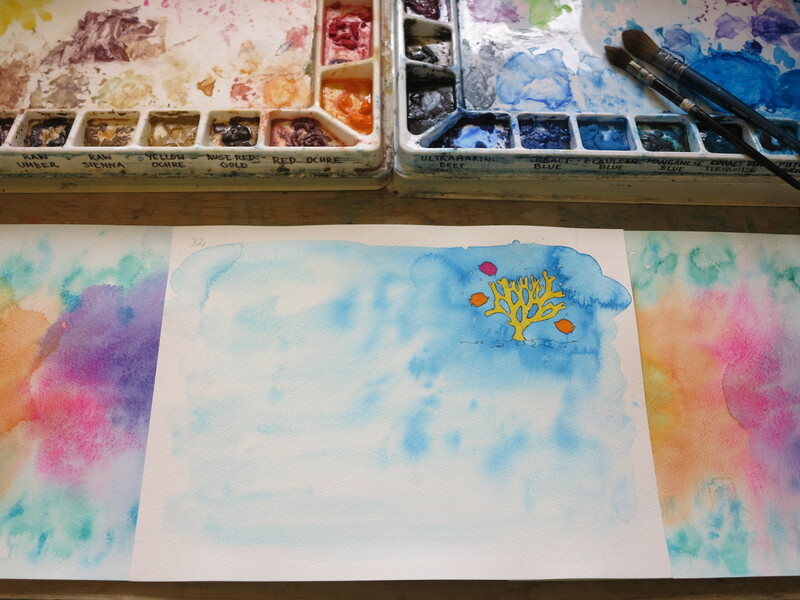 SO excited to ‘sea’ my picture book making front page news!! 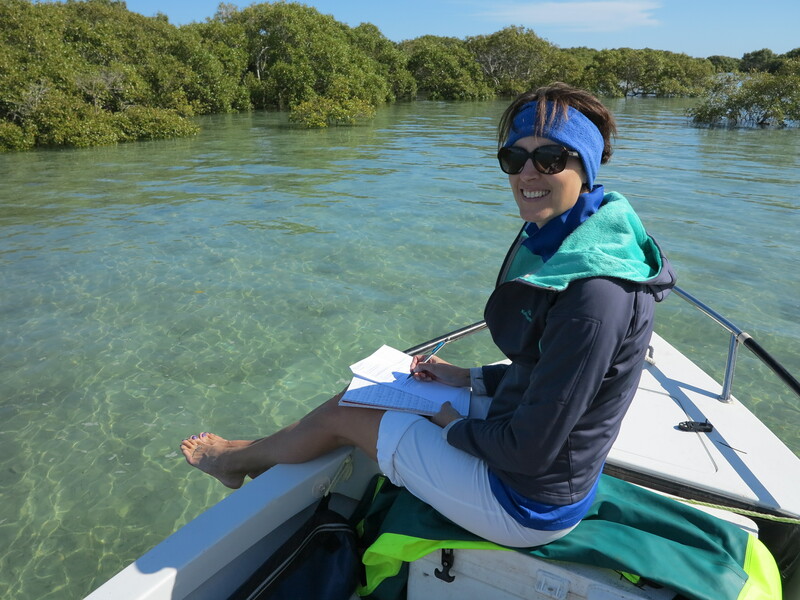 My book provides the science, solutions and hope that together we can ‘cool things down’ for the Reef. 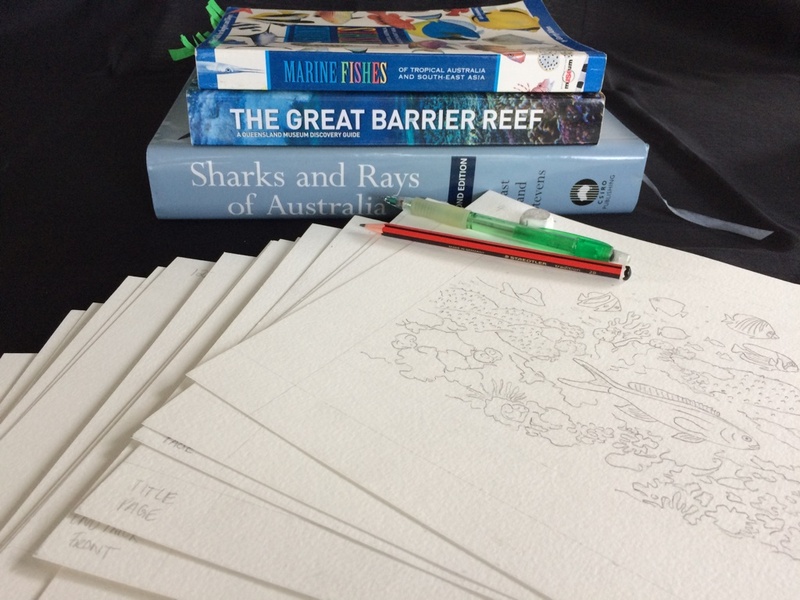 I have created unique colouring-in templates to accompany my picture book so children can ‘sea’ why the Reef is so special. 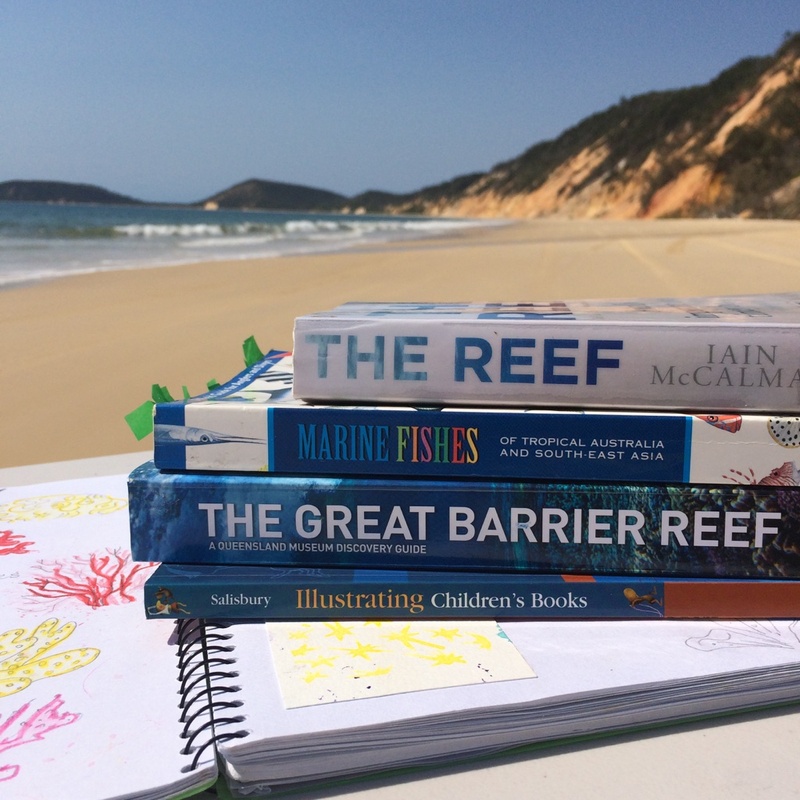 As you can ‘sea’ its never too early to learn about the impacts of climate change on our Great Barrier Reef. 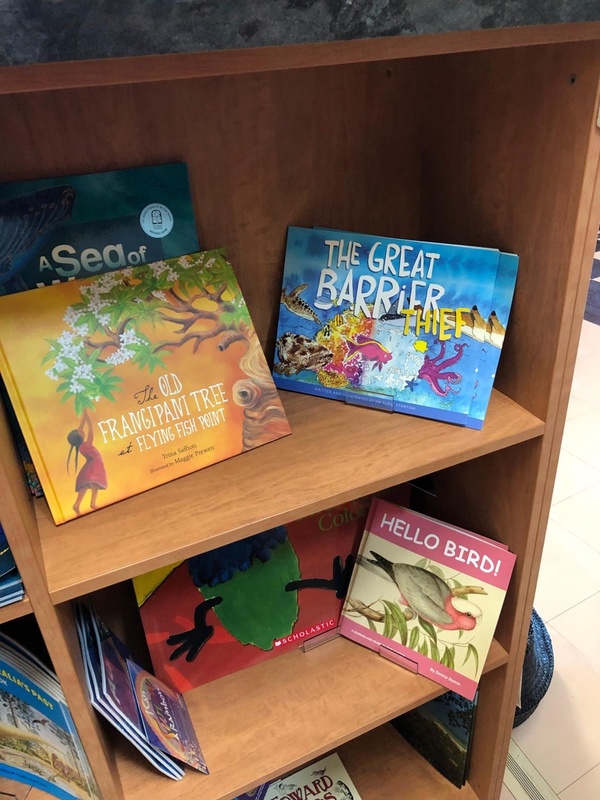 I have also recently donated some of my picture books as prizes to the Kids care about Climate Change drawing contest, which is drawing global attention to the impacts of climate change. 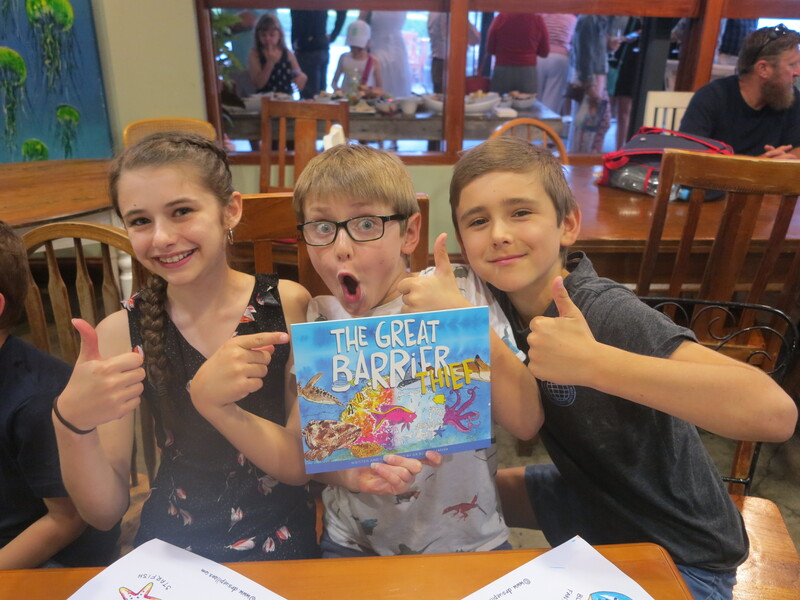 An amazing 1246 drawing entries were received from children around the world and you can ‘sea’ the FIN-tastic winners of my signed book below! 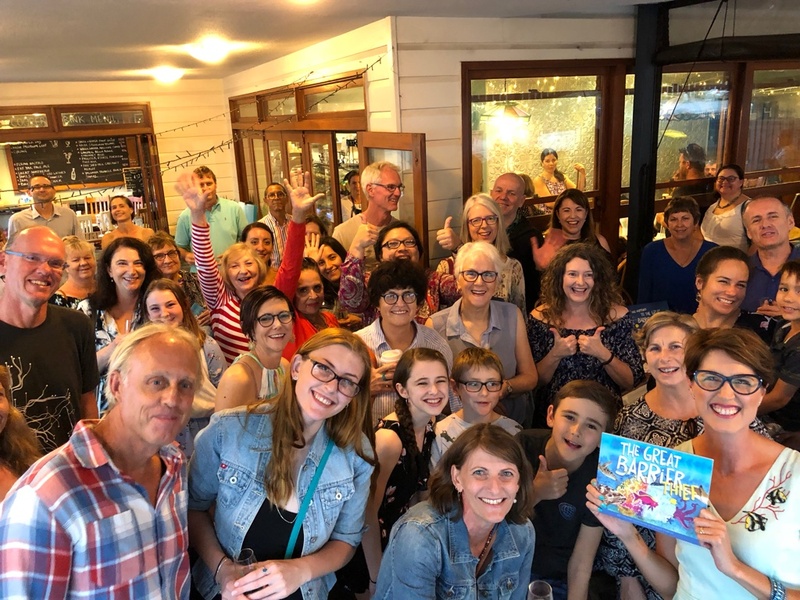 WHAT a BOOK LAUNCH and WHAT a CELEBRATION! 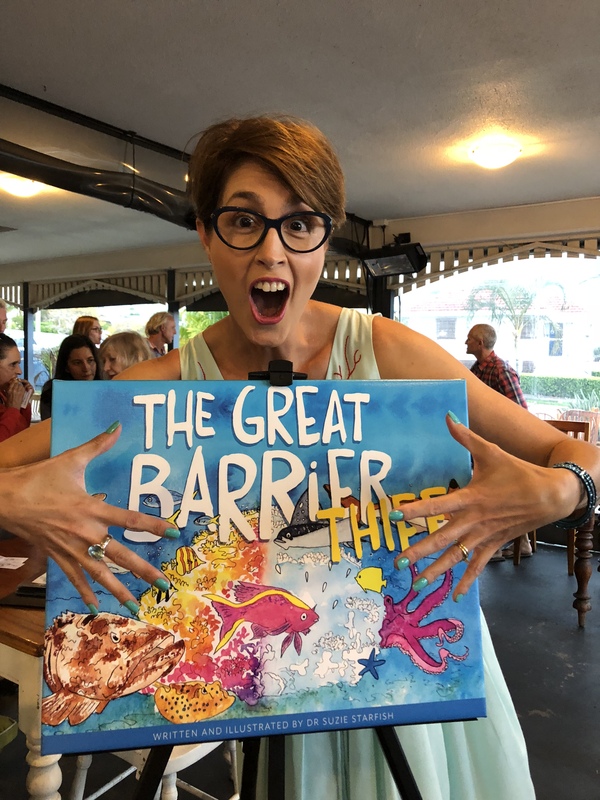 I was quite overwhelmed by the amount of support shown at my book launch to celebrate my first children’s picture book, “The Great Barrier Thief”, in the International Year of the Reef! 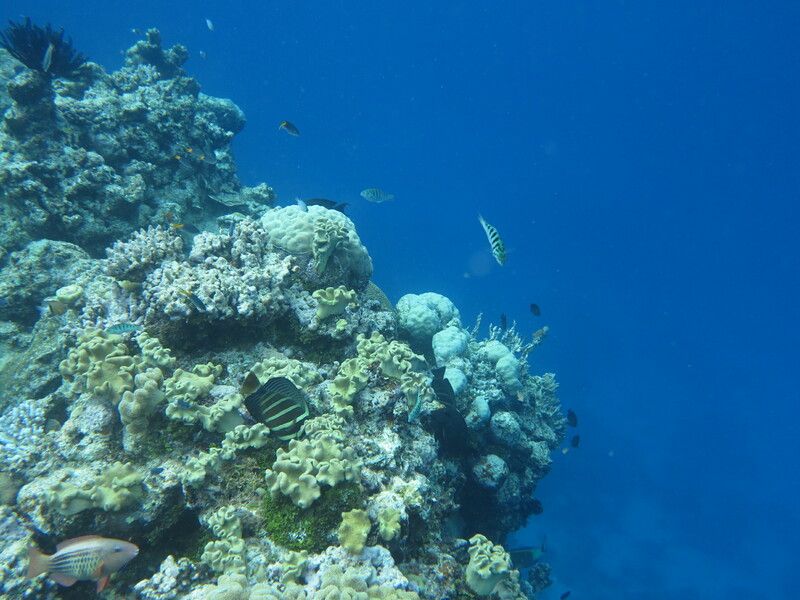 A BIG thank you to everyone who dived in and joined me on my special day! 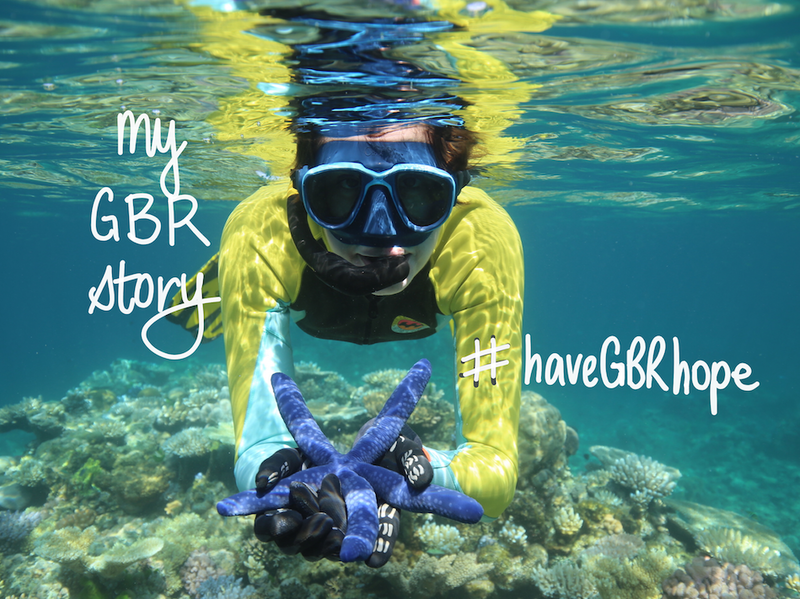 It’s a BIG thumbs up for The Great Barrier Reef! 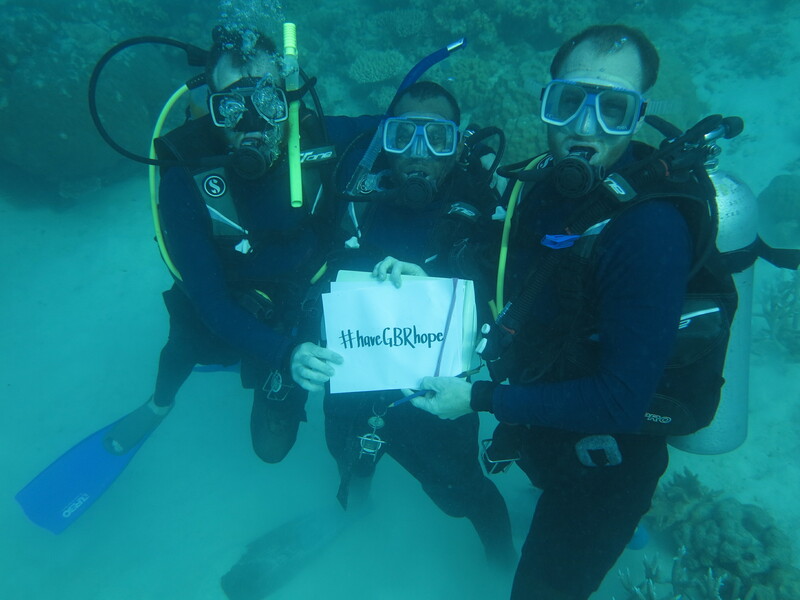 Feedback from the faces of the reefs future! 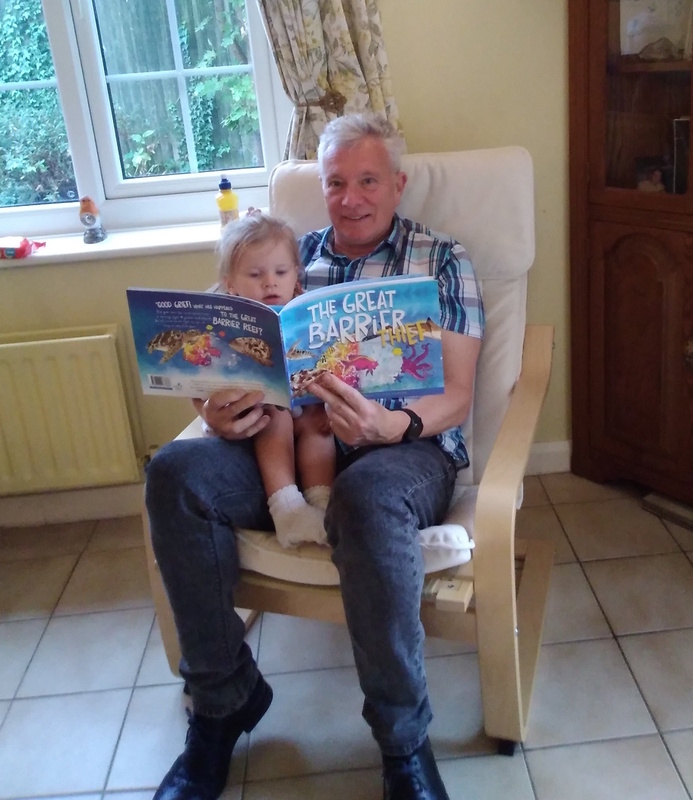 I just love the reaction my book is getting from children around the world! 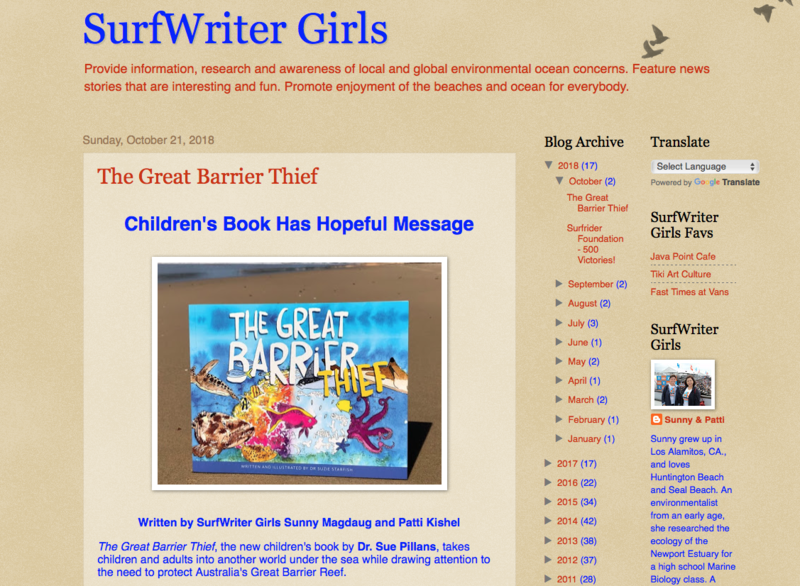 You can ‘sea’ some of the feedback on “The Great Barrier Thief” from the faces of our reefs future, our children! 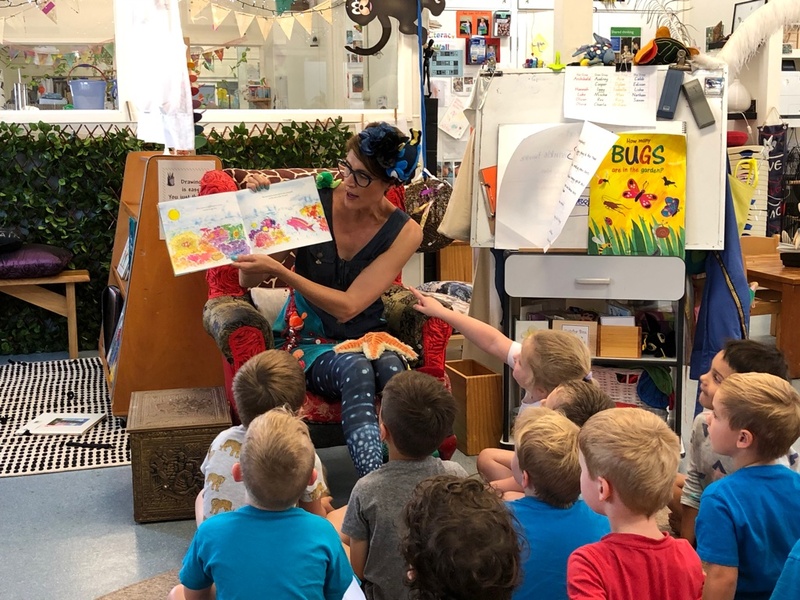 I’m excited to see my book is now in seven countries across the world, from the UK, USA, Canada, Ireland, New Zealand, Malaysia and in Aussie schools, kindy’s, childcare centres and libraries. 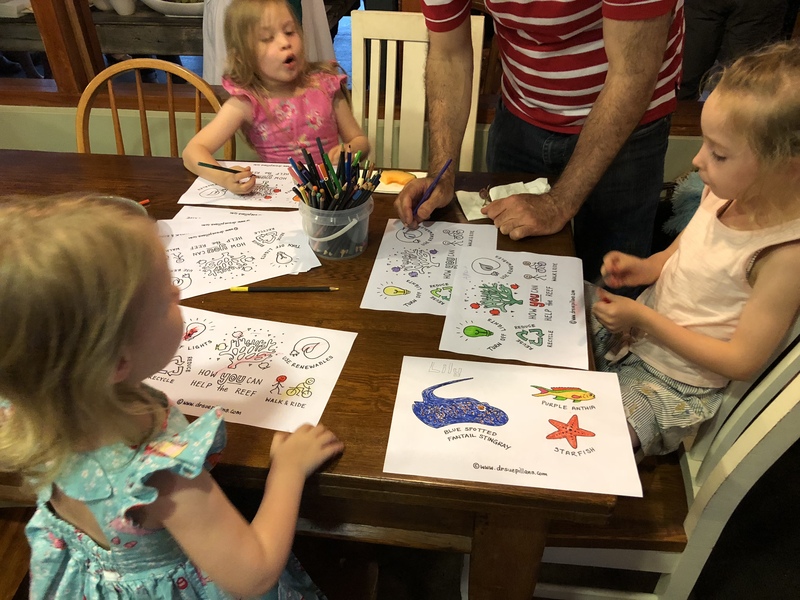 It’s official, the story is a fun and educational way to learn about the living colours of the reef! 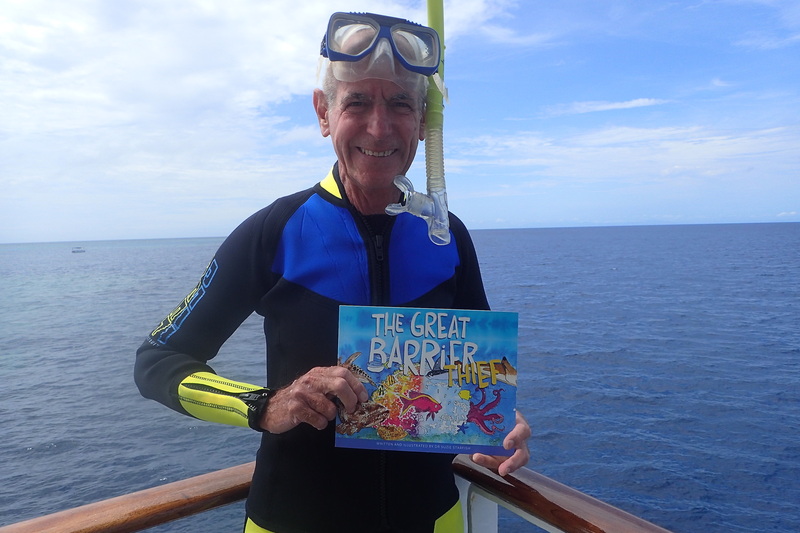 My Dad on the Great Barrier Reef with a copy of “The Great Barrier Thief“! 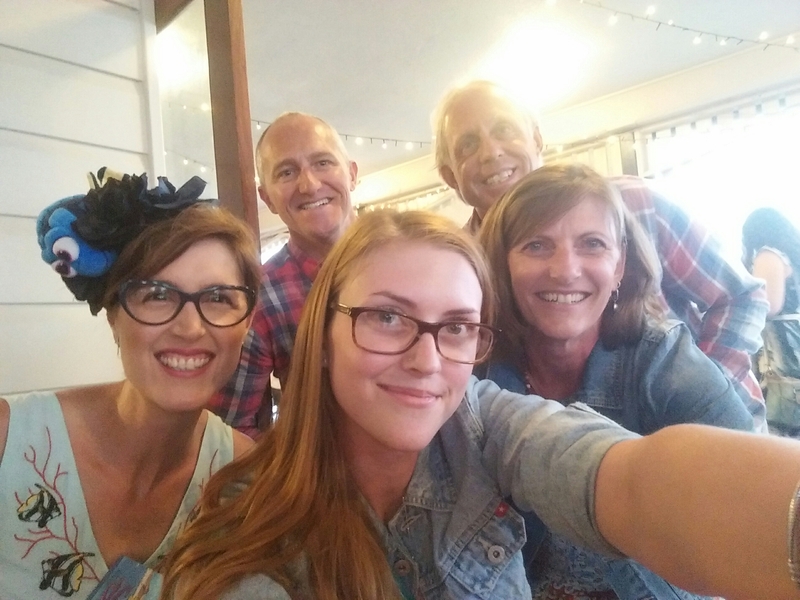 Thanks to my family for all of their FIN-tastic support of my story! 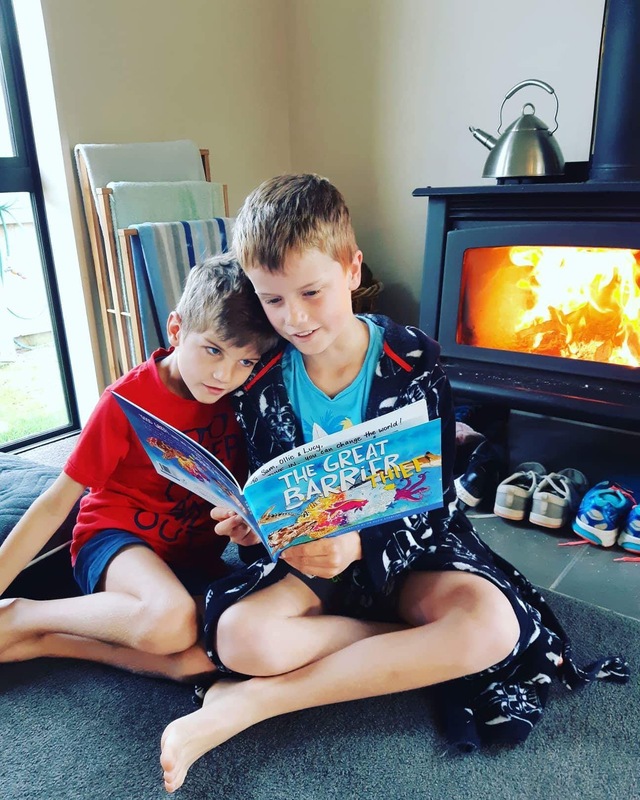 Just cosying up with “The Great Barrier Thief” in chilly New Zealand! 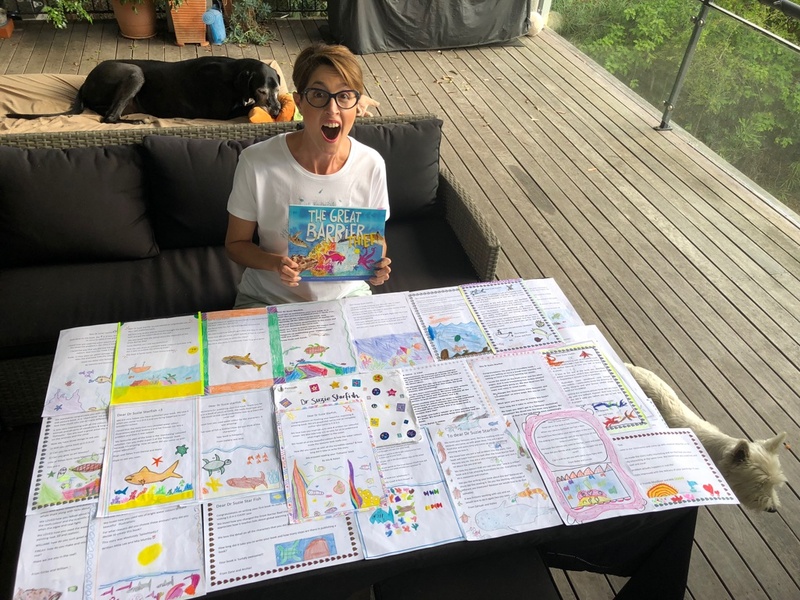 How amazing to receive these 48 letters from primary school students in remote Western Australia (Exmouth) after they read my book! Thank you for your FIN-tastic feedback. 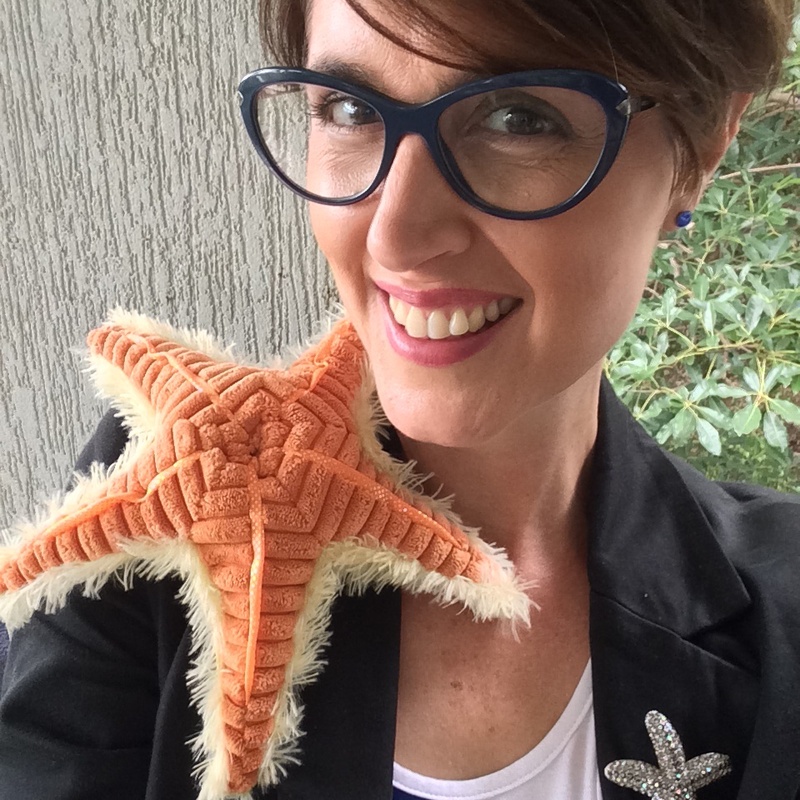 Dr Suzie Starfish has written back to each of you! 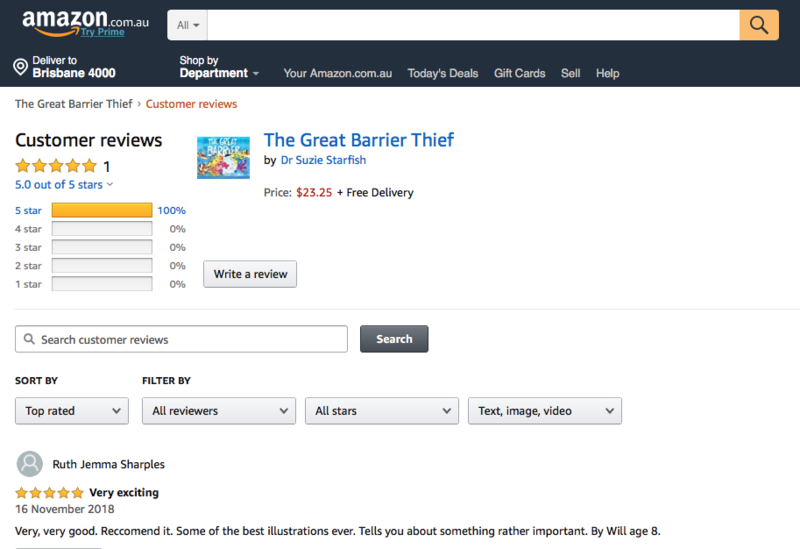 5-Star book review (Amazon Australia): My very first review on Amazon by Will aged 8 who said “Very, very good. Recommend it. Some of the best illustrations ever. 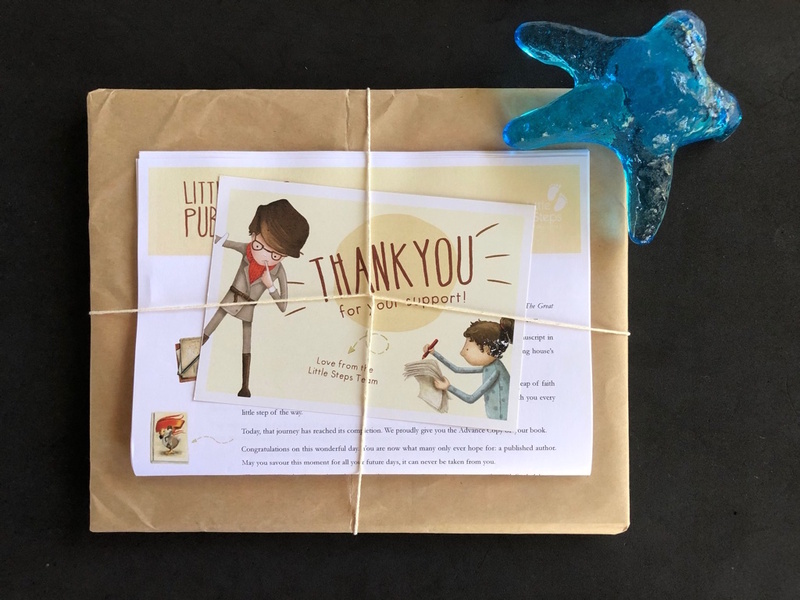 Tells you about something rather important.” Thanks so much Will for your FIN-tastic feedback! 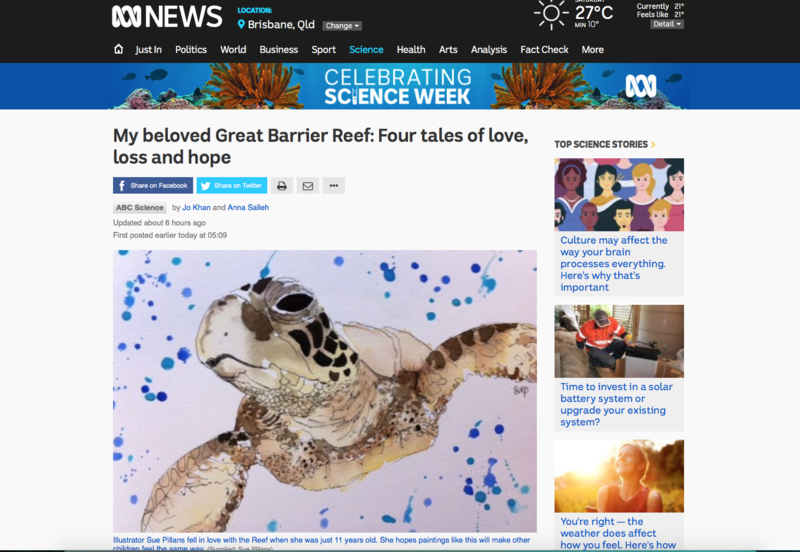 I am honoured as a children’s author/illustrator to be featured in the ABC News story My beloved Great Barrier Reef: Four tales of love, loss and hope, which features some of my marine artworks and my reef reflections as a child sea-ing the Reef for the first time! 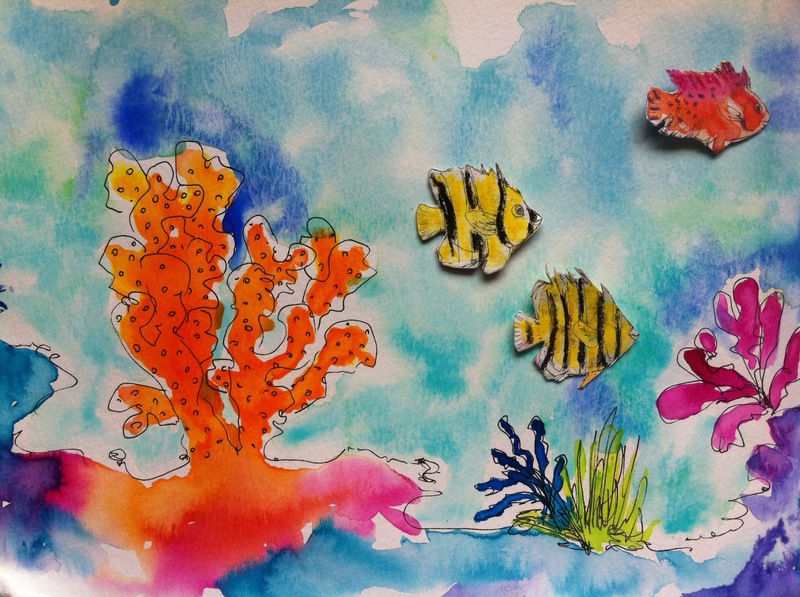 I have always been drawn to the ocean and I just love sea-ing the living colours of our Reef whenever I’m lucky enough to visit them. 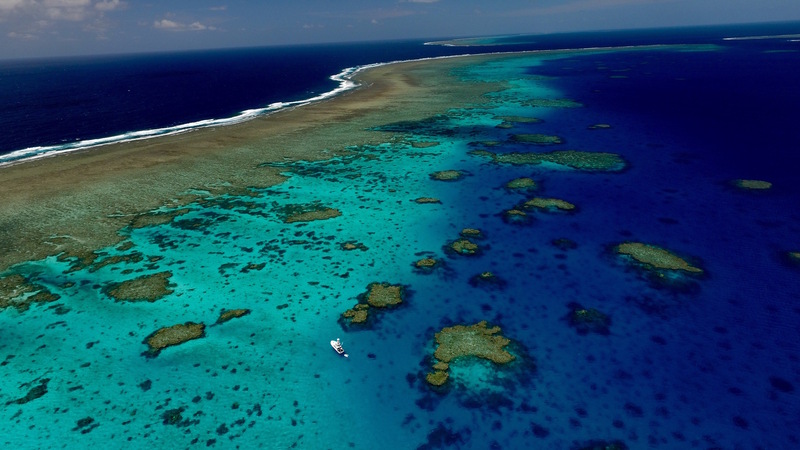 I have been working on my Great Barrier Reef story for many years now, prompted by the impacts I have seen first hand on our reefs and the constant doom and gloom about the Reefs demise. 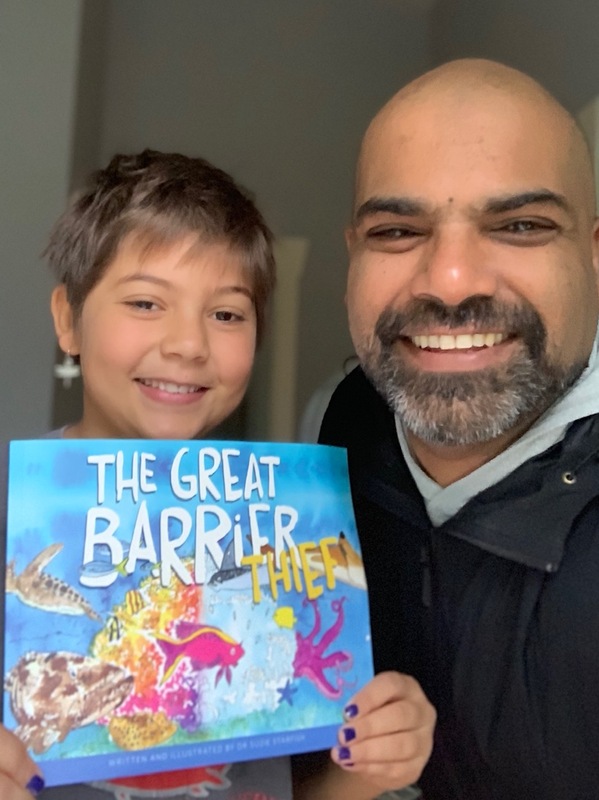 I believe good news travels fast vs doom and gloom so I have written a story that draws attention to the impacts facing our Great Barrier Reef but which also gives children hope that there are ways that each of us can do something to help the reef, no matter how big or small we are. 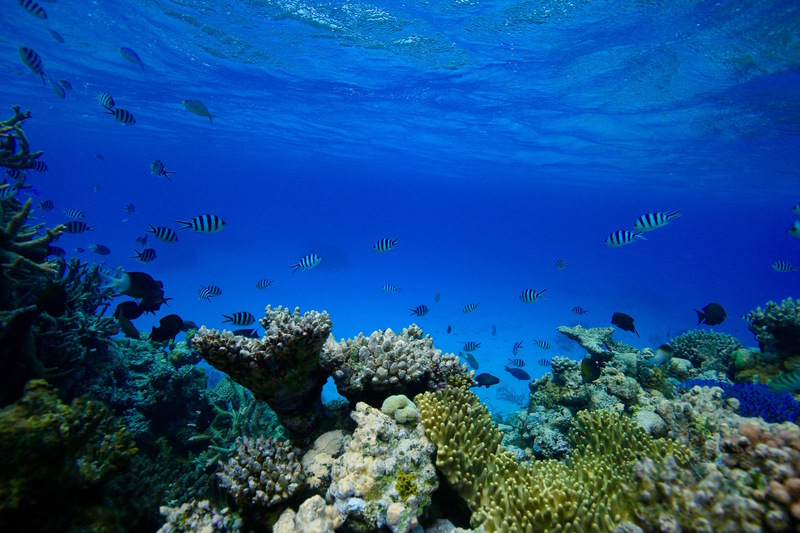 WE need to cut our greenhouse gas emissions NOW to cool things down right away, so our children have a reef tomorrow. 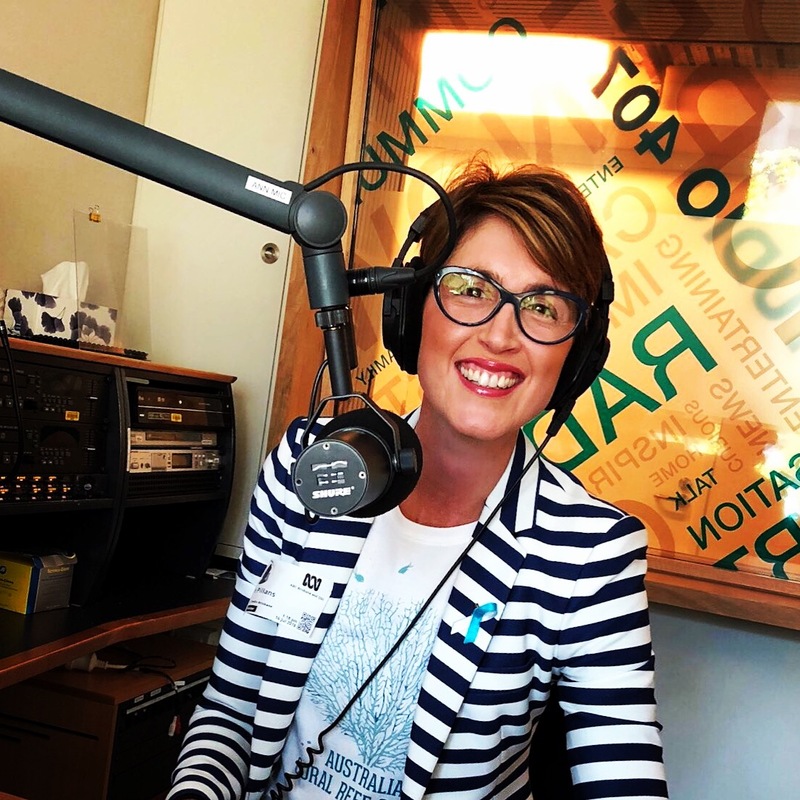 This story would not have surfaced if it wasn’t for the amazing support and advice of my writing mentor and friend, the very talented, Michelle Worthington. Thank you Michelle for encouraging me to just DIVE IN! 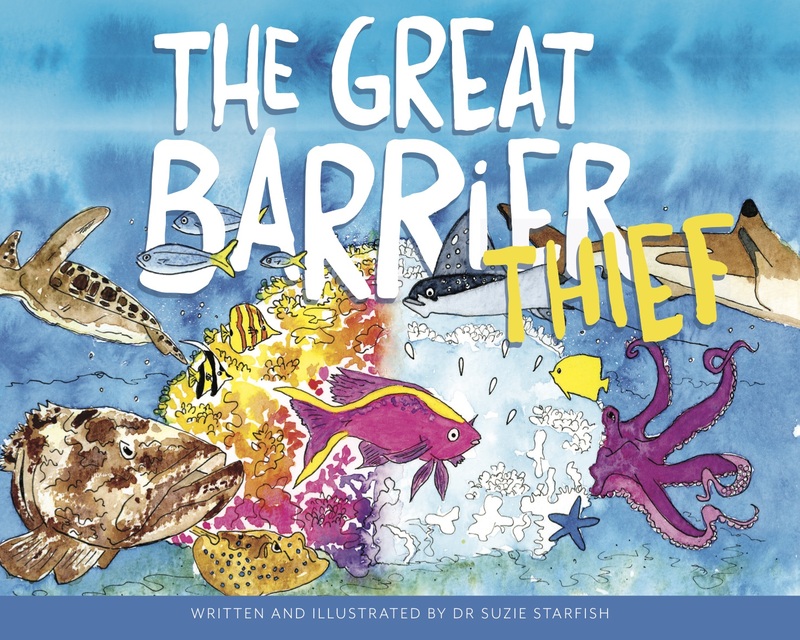 The theme of the story can easily be explained by its title, The Great Barrier THIEF! 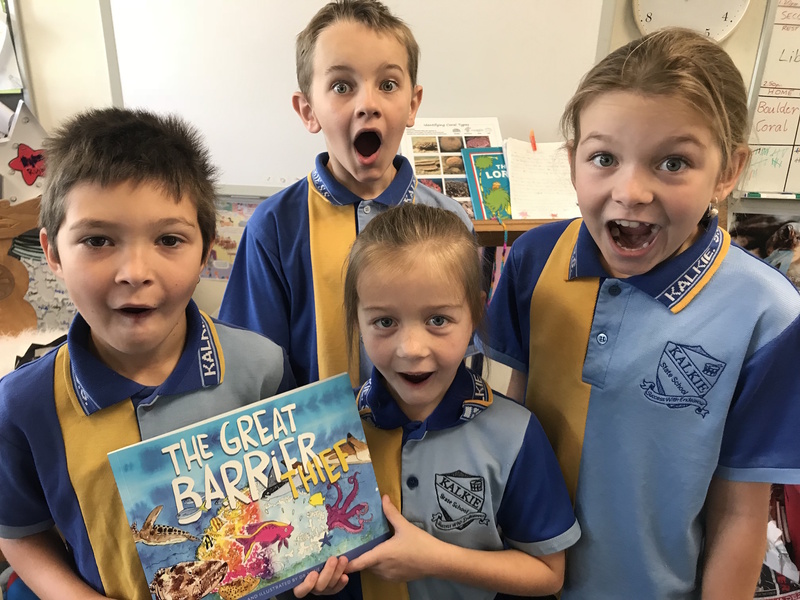 The story is about the challenges facing the Great Barrier Reef told through the eyes of a feisty female fish named Anthia. 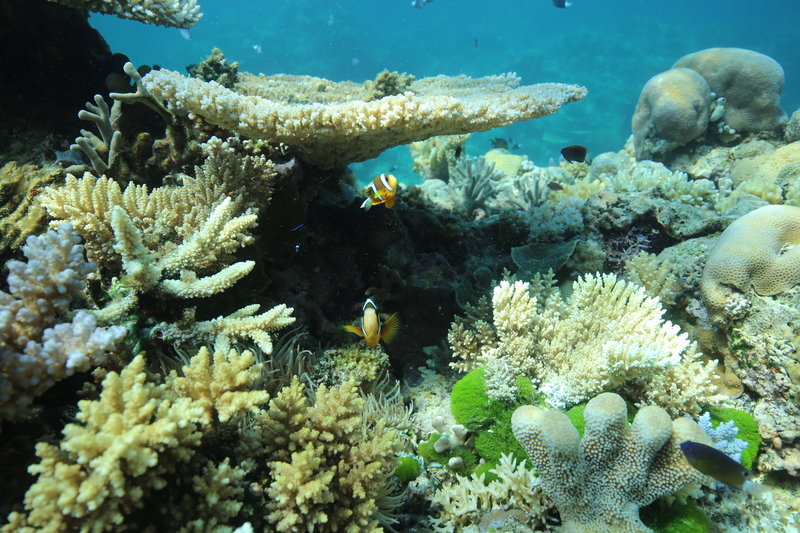 The story is based on marine science and paints a picture (literally) of what happens to our reefs in the face of climate change. 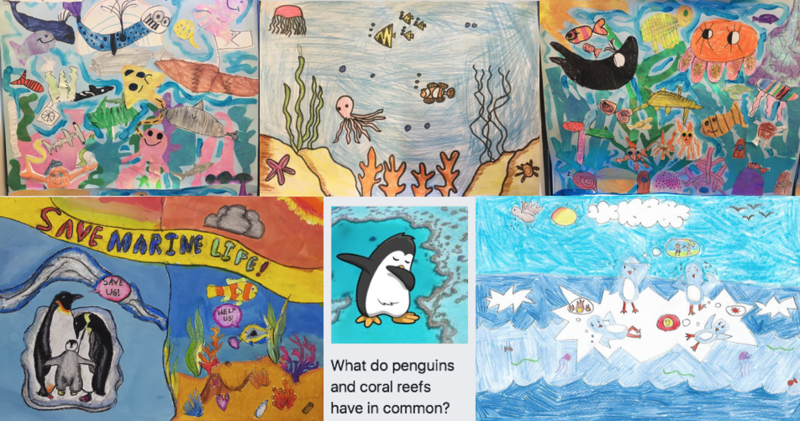 Although the storyline is not always about happy times on the reef, my story is full of hope and Ocean Optimism as I cannot imagine a world without coral reefs, can you? Remember, colours are the smiles of nature so follow my story at #haveGBRhope. 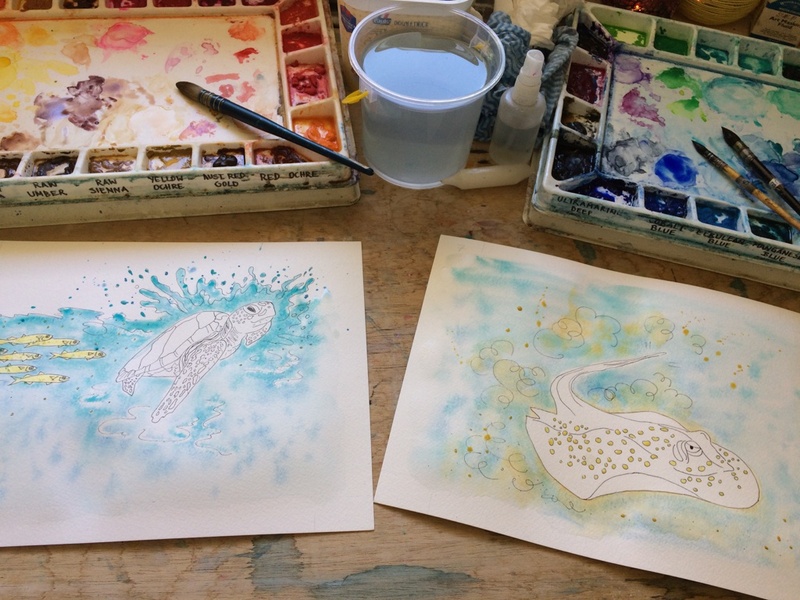 I used pen and watercolours to create the illustrations for this story as I think these mediums really bring the underwater characters to life, as you can ‘sea’ below! 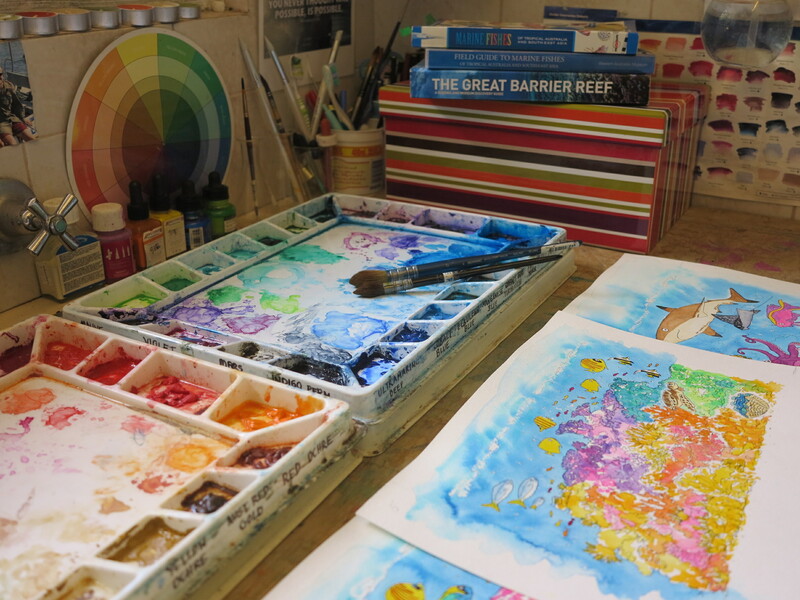 These artworks are just some of the ideas I had for the book, which I hope you can ‘sea’ soon as page-turning paintings! 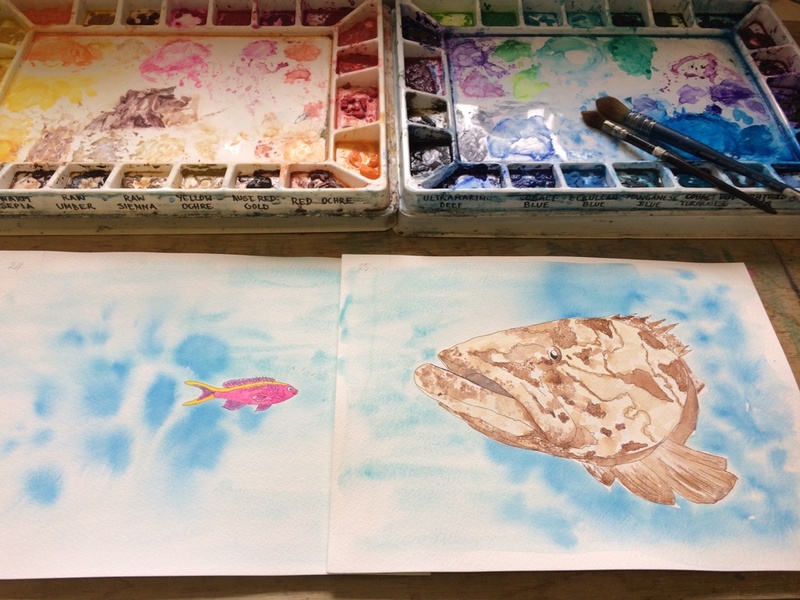 Below is a time series of progress in the lead up to launching my debut children’s picture book for our future ocean stewards, our kids. 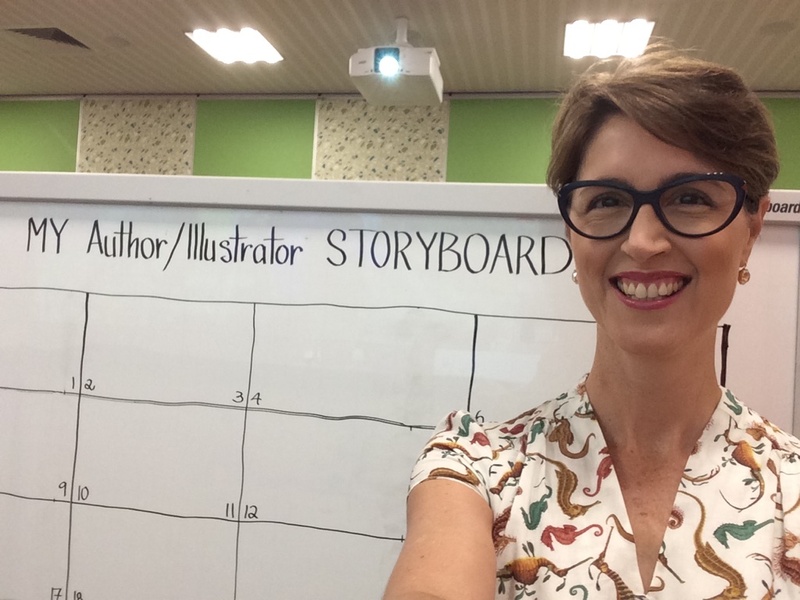 My Timeline – Creating the WORDS & PICTURES! 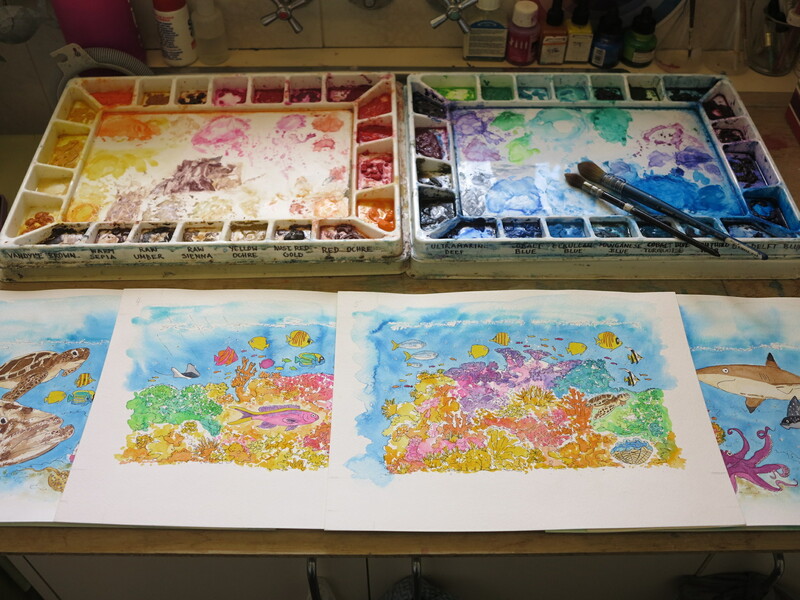 Below is a timeline of how I have created the words and pictures for my children’s picture book so you can ‘sea’ the steps and progress of creating my first underwater story for children. 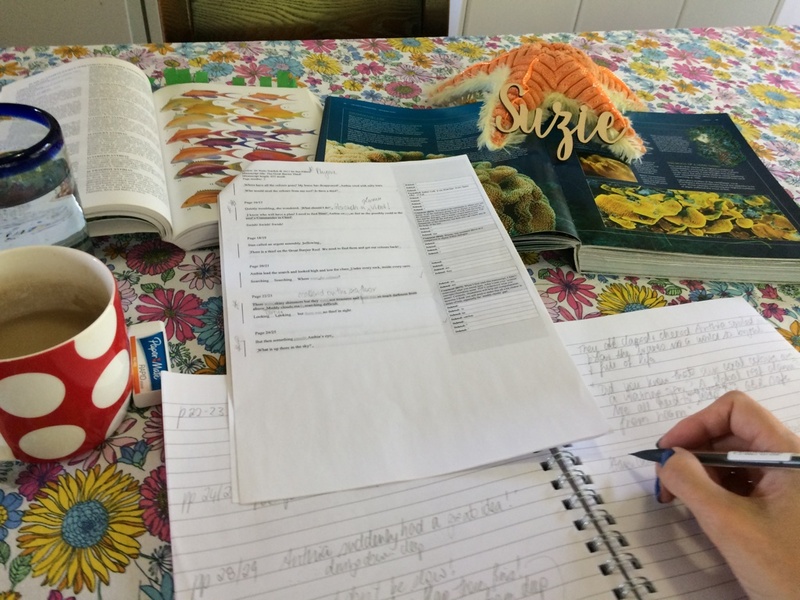 April 2017 – Edits back already! More writing, writing, writing! 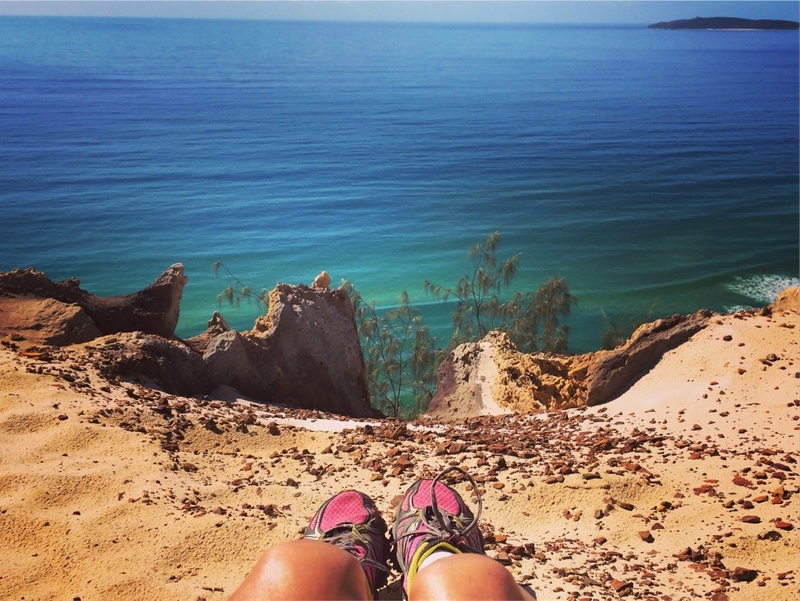 May 2017 – Just taking in some Vitamin Sea as I continue writing and editing the manuscript! 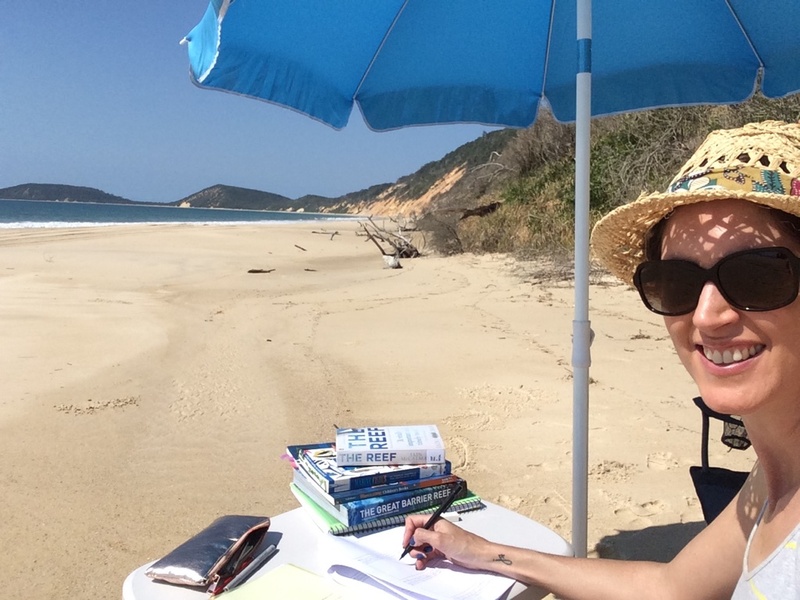 June 2017 – Putting the final touches on the manuscript whilst floating around my Bay backyard! 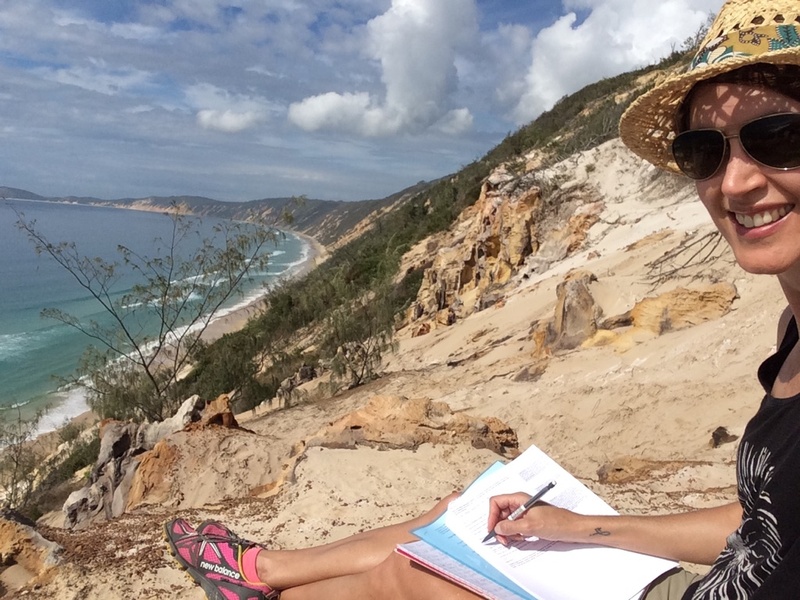 July 2017 – Manuscript completed! August 2017 – Sea-ing the beauty in nature whilst I start the illustrations for my Storyboard! 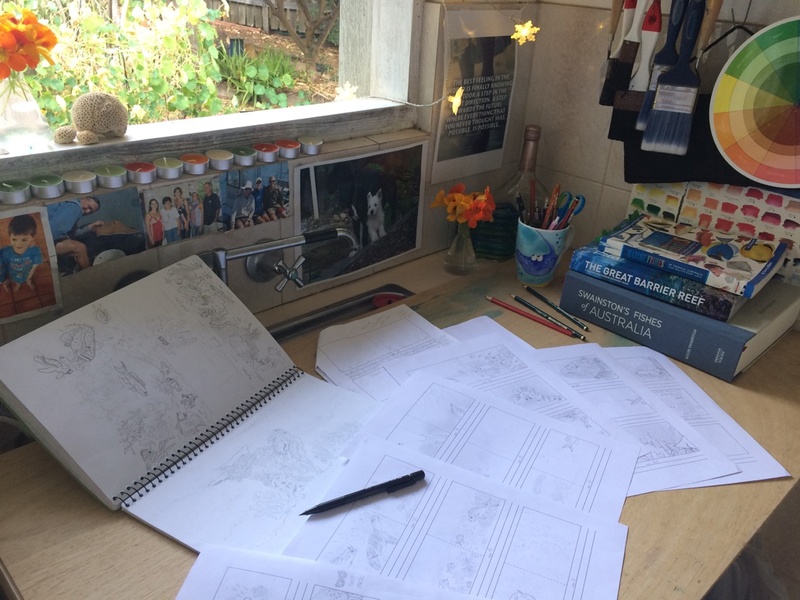 September 2017 – From pencil to paper the Storyboard process is in full swing back in my studio! 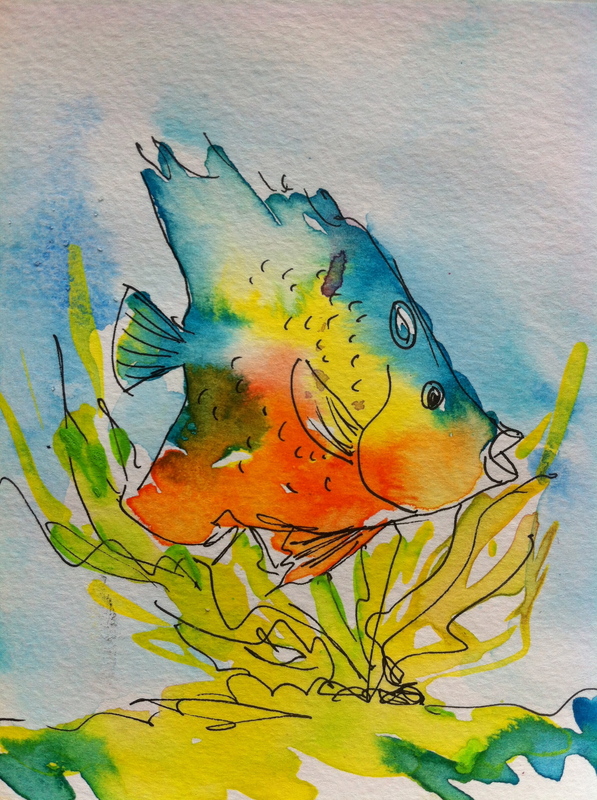 This is my Illustration-INSPIRATION right from the outer Barrier Reef thanks to my hubby Dr Richo and Lee Hodgetts from Weipa Sports Fishing Thanks boys for showings us how GREAT the Barrier Reef is! 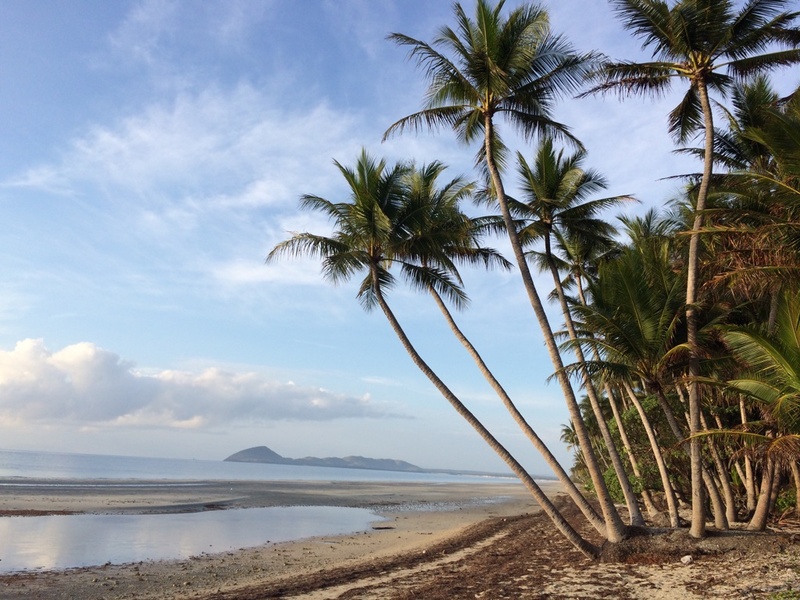 November 2017 – Drawing upon the paradise of Tropical North Queensland where I’m chilling out at Chilli Beach. 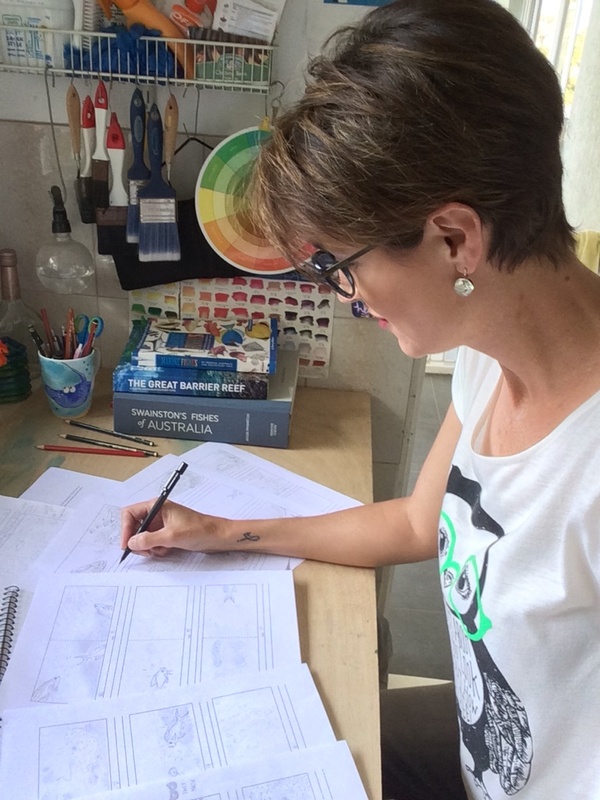 December 2017 – Ending the year on a high note by submitting my ‘Roughs’ illustrations to my Publisher for review with GREAT feedback! 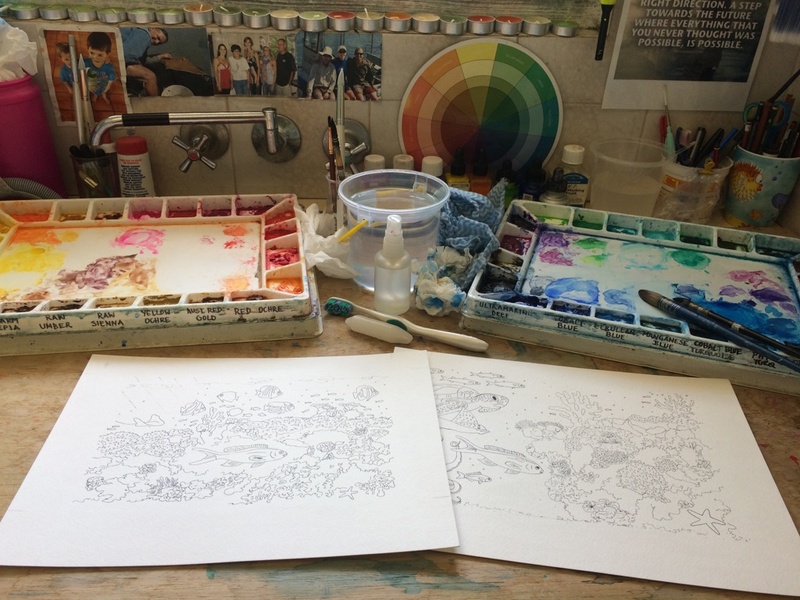 This is what drawing out a 32+ page kids picture book looks like! 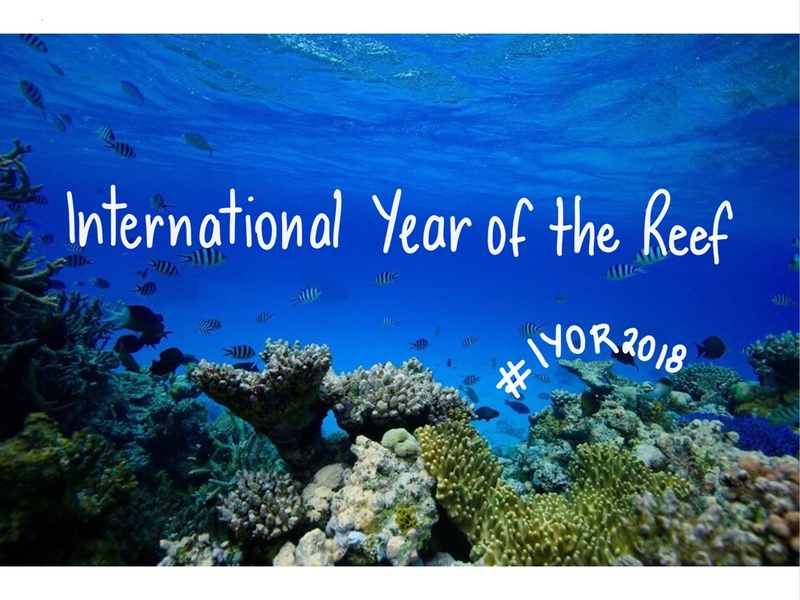 January 2018 – 2018 is the International Year of the Reef and the year I release my book!! January 2018 – Let the pen work for the 32+ pages begin! 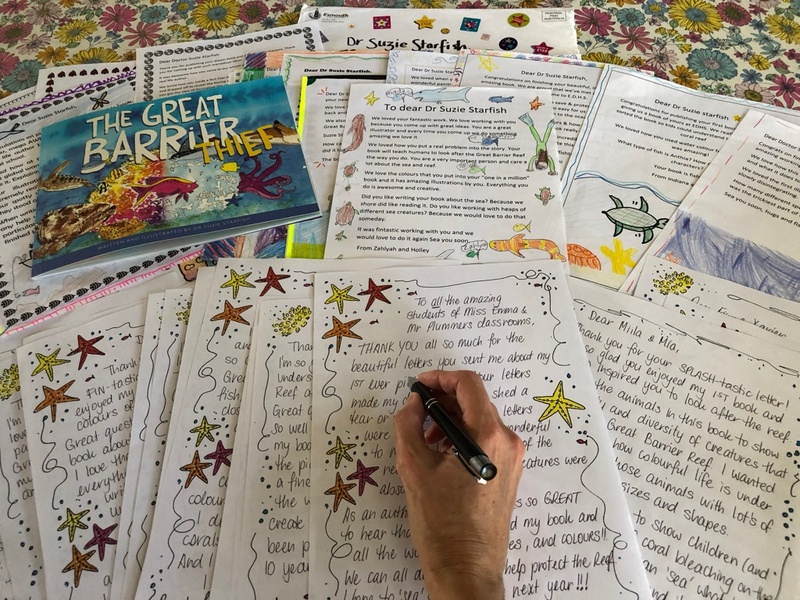 You can ‘sea’ some of the stories characters coming to life here and I’m starting to outline the impacts on the Great Barrier Reef which are black and white! 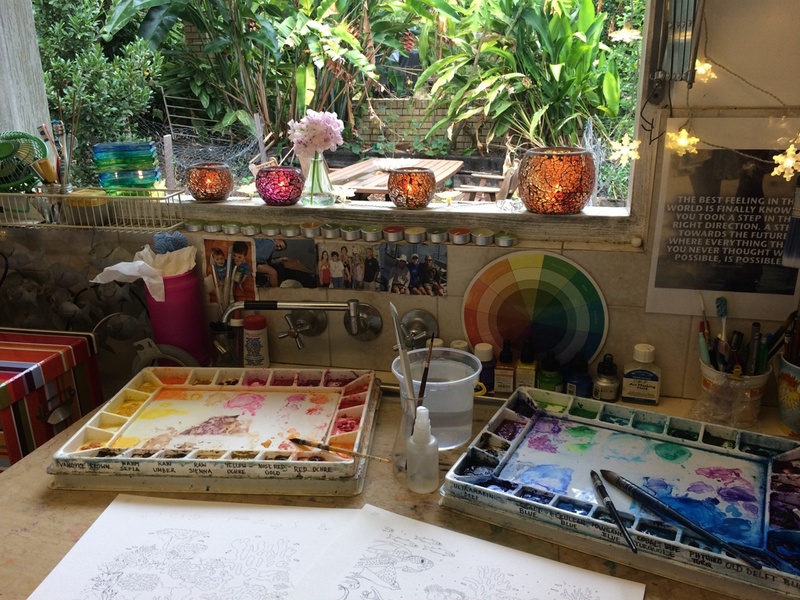 My art studio (…and laundry!) and my happy place (most of the time! ), where my creativity is right at home. 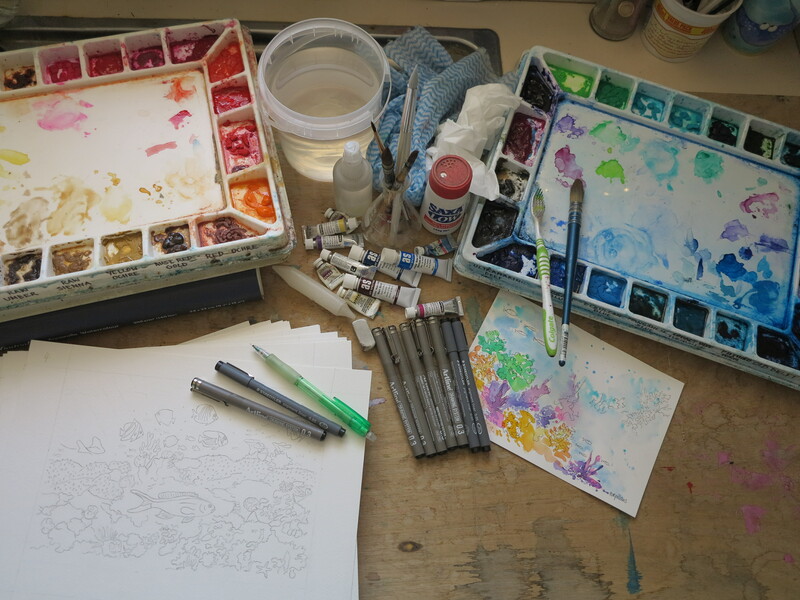 January 2018 – The pencils, pens, paper and paints to start the final process of painting!! 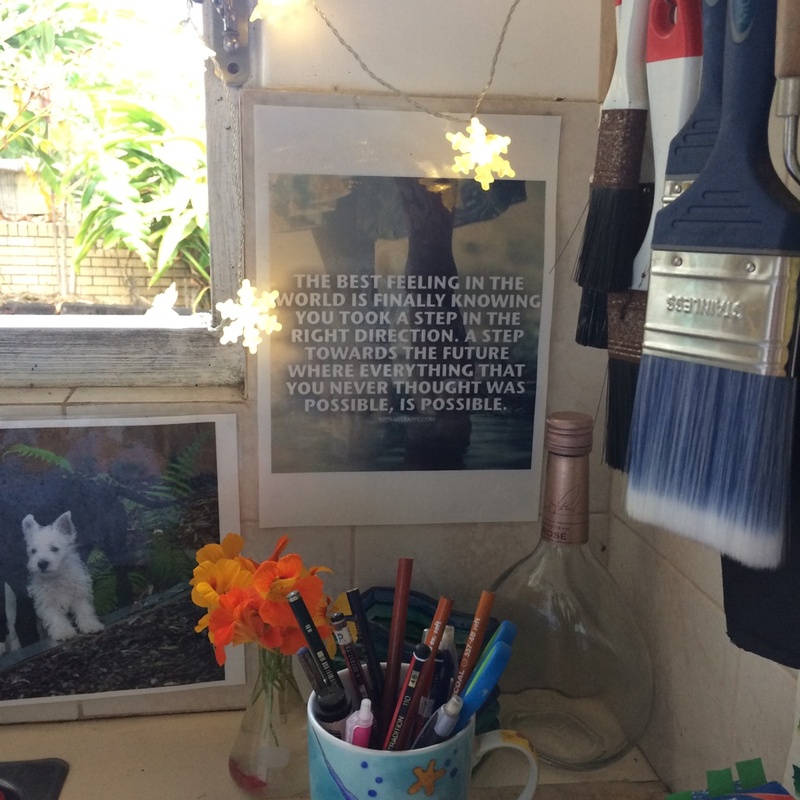 January 2018 – Let the painting begin!! A sneak peak at some of the stories characters! January 2018 – Meet Anthia, one of the characters from the book! February 2018 – is my deadline so you will ‘sea’ sneak peaks here of some of the illustrations! 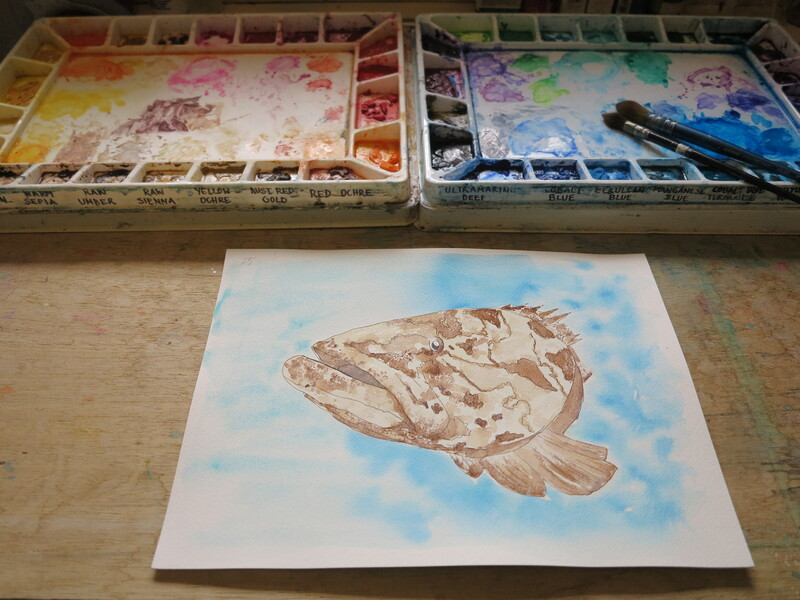 Here are the “Living colours of the Reef“, a mock-up painting for the first page of the book!! 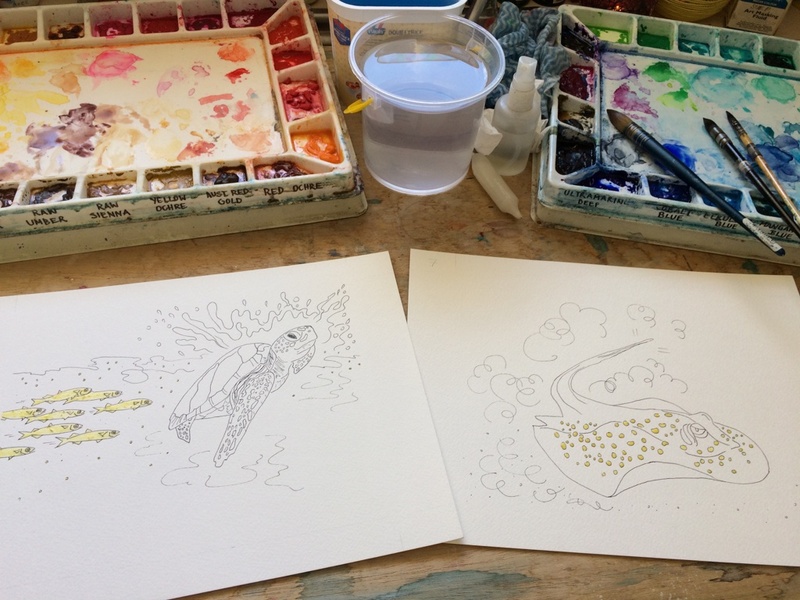 March 2018 – illustrating some of the sea creatures’ movement and magic that happens on our Great Barrier Reef, capturing the splash and dash! 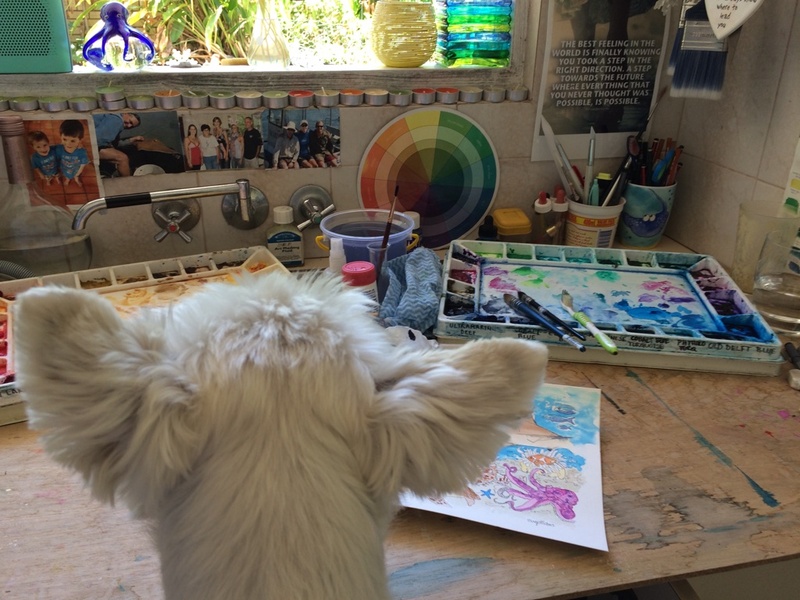 March 2018 – My creative companions are always there to ‘help’ me with my paintings! 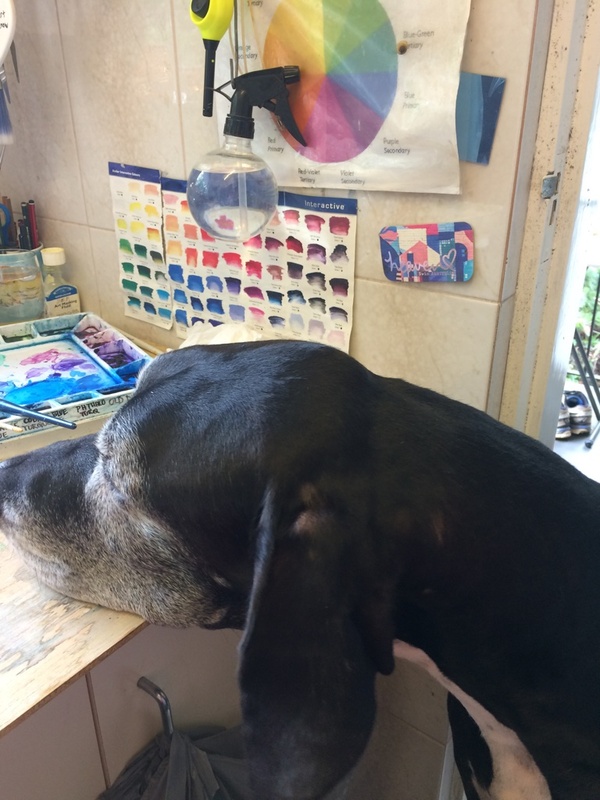 Meet our big boy Jack the Great Dane and his bestie the Westie Mr Fergus. What a pawsome pair! 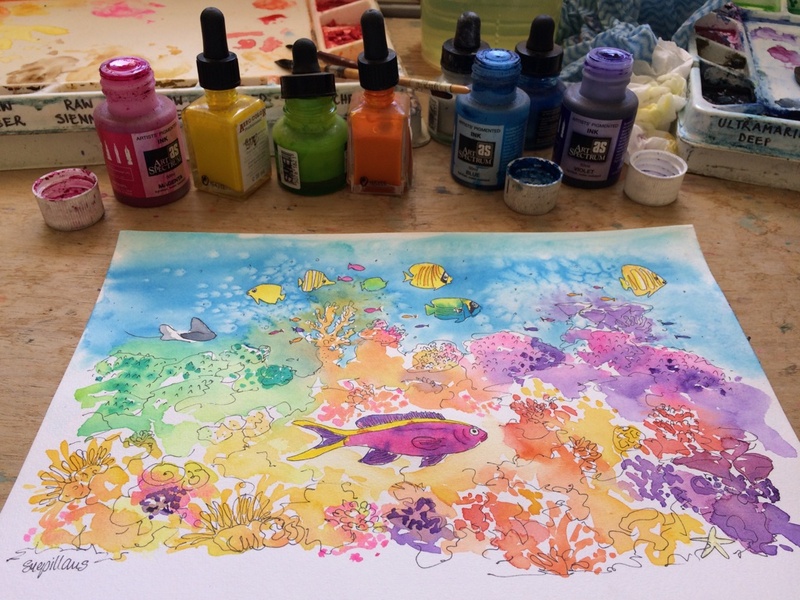 March 2018 – Final paint to paper to bring the living colours of the Reef to life! I’m SO EXCITED!! 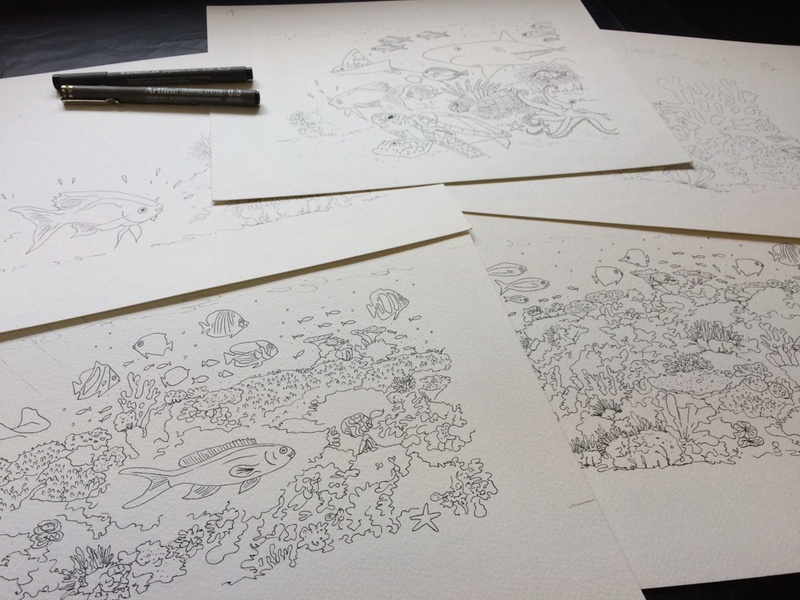 March 2018 – SNEAK PEAK at the illustrations for the 1st page of the book, a busy underwater city! March 2018 – FINISHED my 32+ illustrations! SO EXCITED!! Now they are off to the Publisher! April 2018 – Proofs of the book have now been reviewed and reviewed and approved, so my book is off to the printers!!! Here are some sneak peaks of some of my favourite scenes in the book! 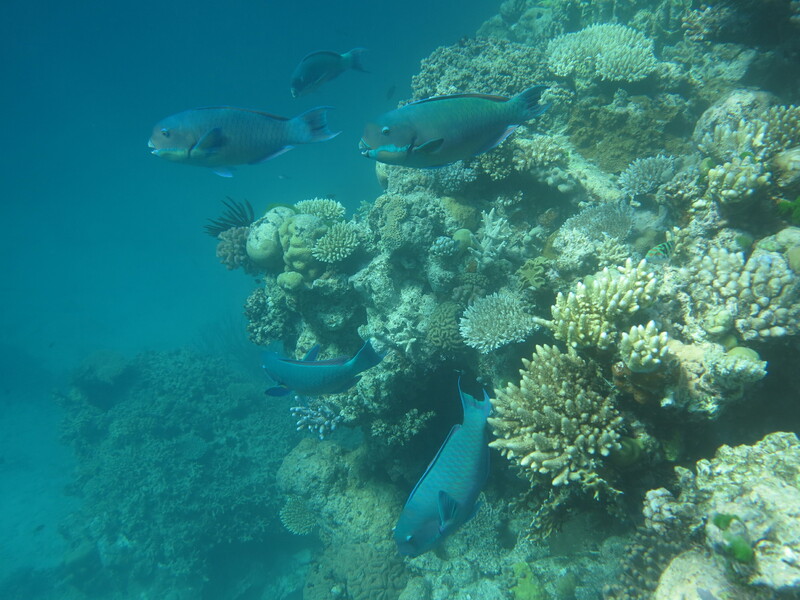 It is my pleasure to introduce you to Anthia and her friend Stan, the Commander and Chief of the Reef. 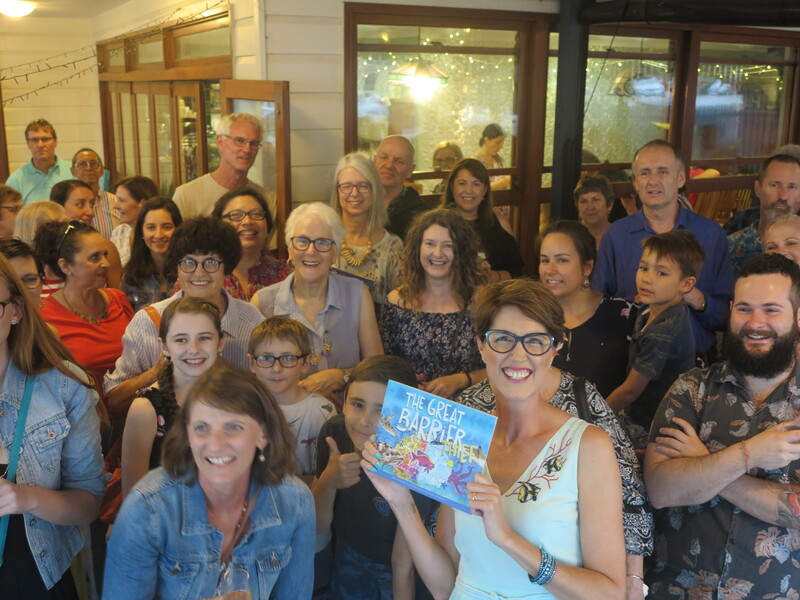 April 2018 – I was honoured and proud to be on the Panel as an Author/Illustrator for the ‘Words & Pictures’ workshop to share my story of the Great Barrier Reef with this talented bunch! May to June 2018 – now just waiting, waiting, waiting for news on my book! Best to get some Vitamin Sea from somewhere over the Rainbow in the meantime! 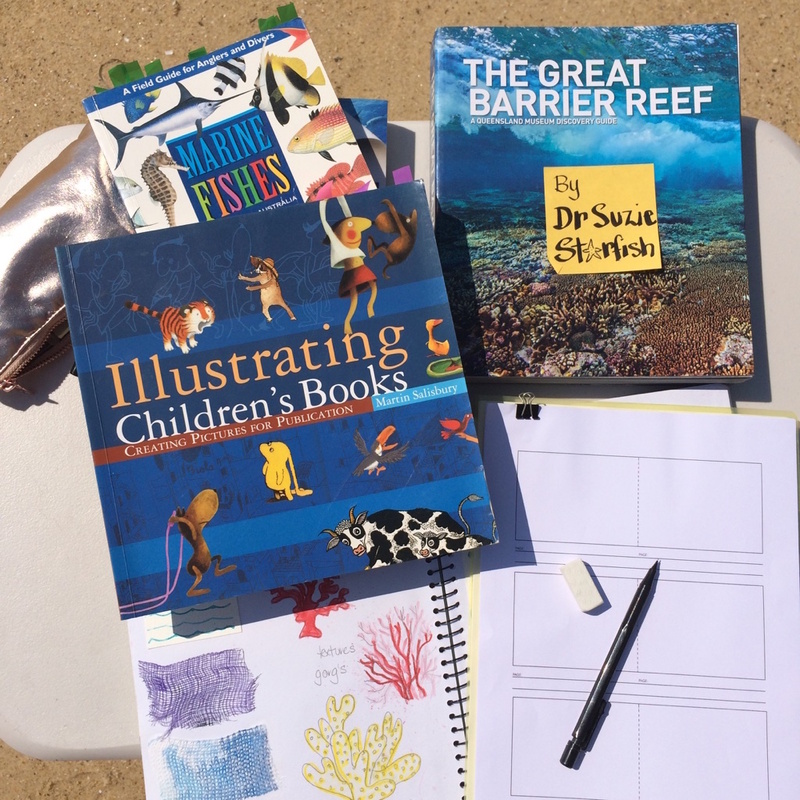 July 2018 – Making a splash about my love for the Reef and revealing the title of my book which will be aired on ABC Radio National during National Science Week in mid August!! So stay tuned! 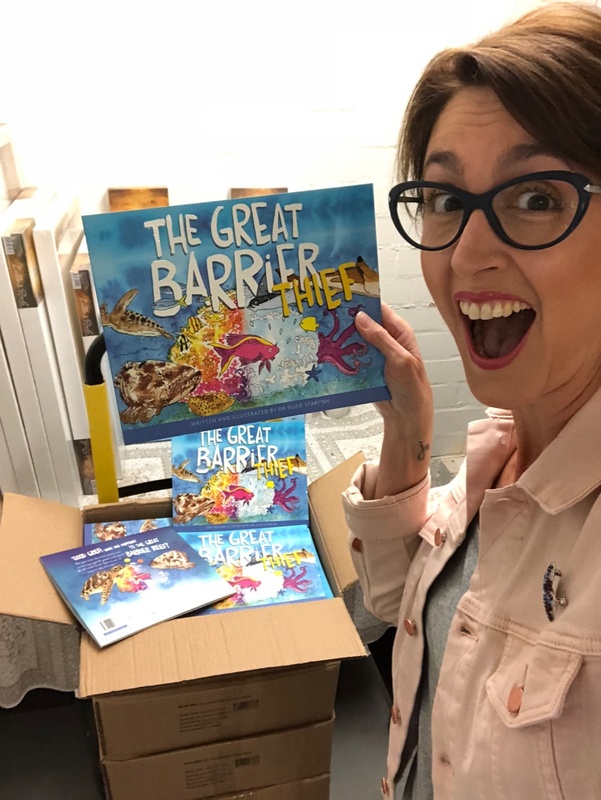 30th July 2018 – I have just received the Advance copy of my book and can’t wait to share it with everyone! Books should arrive in early September so stay tuned here for pre-sale announcements! 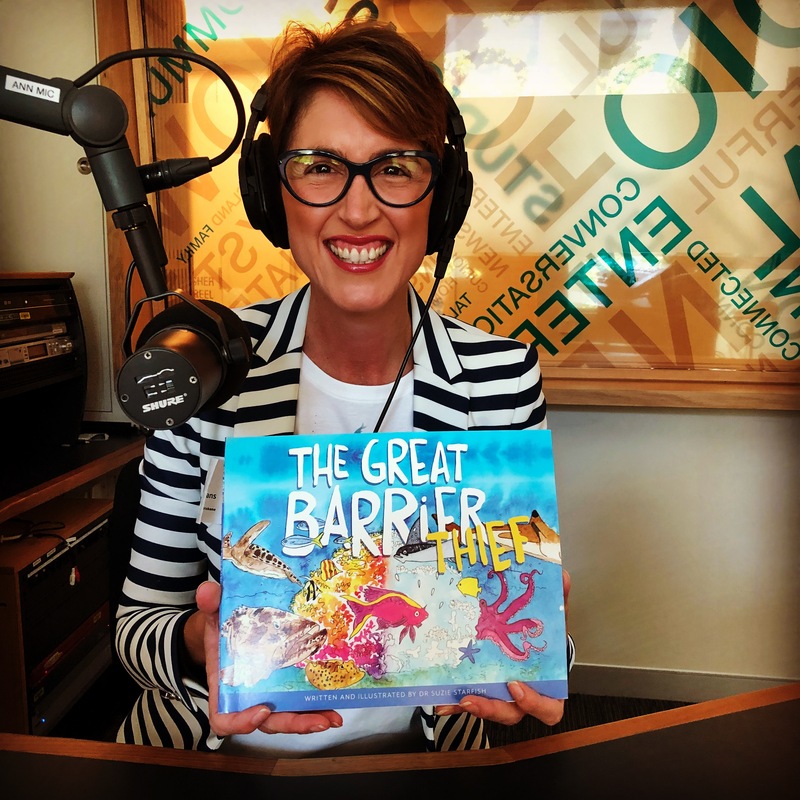 August 2018 – EXCITED to reveal the title and front cover of my 1st kids picture book on ABC Radio and be featured on ABC News during National Science Week! 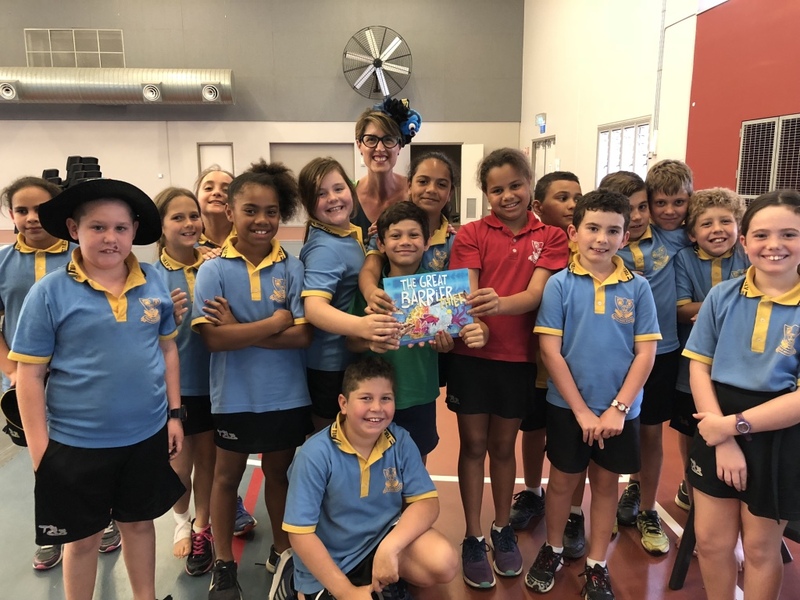 THEN during Book Week I was able to read my book for the FIRST time to primary (and high) school students in Far North Queensland. 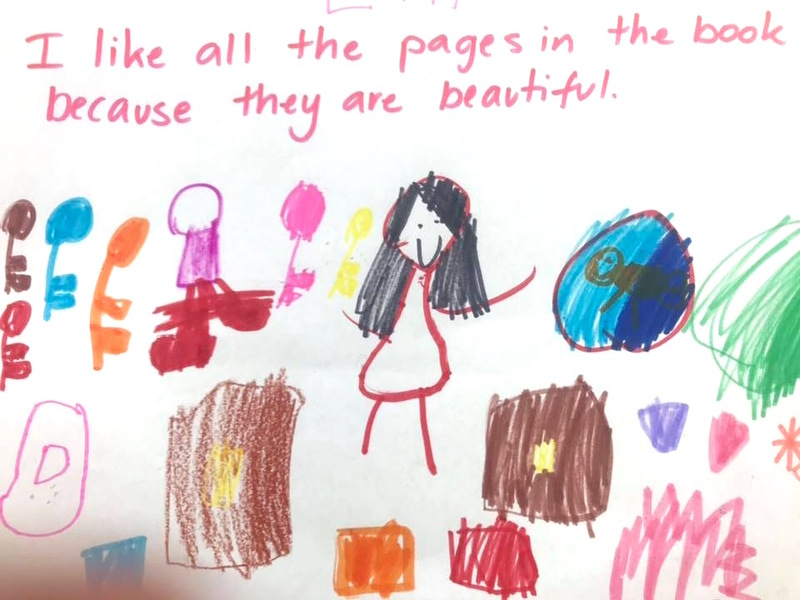 AND who says picture books are just for the little ones, say the Year 10s from Tully High School! WOW!! 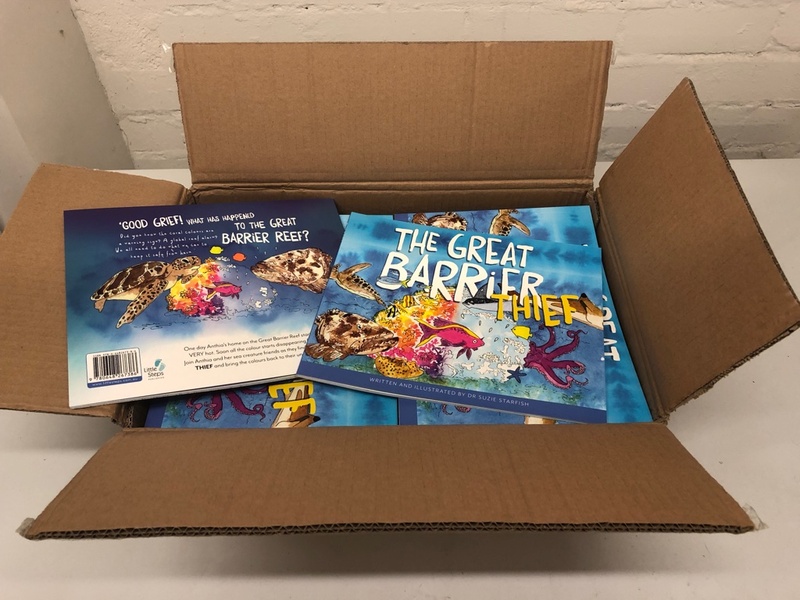 August 2018 – THE BOOKS HAVE ARRIVED!!! I’M SOOOOOOOOOOO EXCITED!! 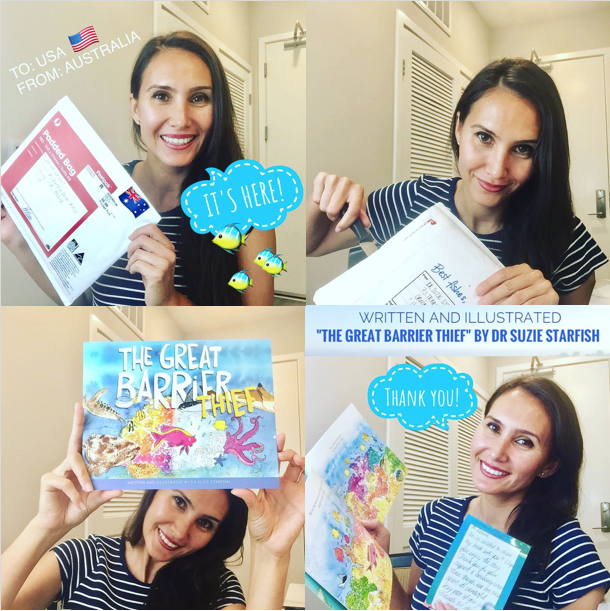 September 2018 – Let the book signing, sending and shipping begin! What a great response to the pre-sales of the book too, they are now on their way around the country and overseas! 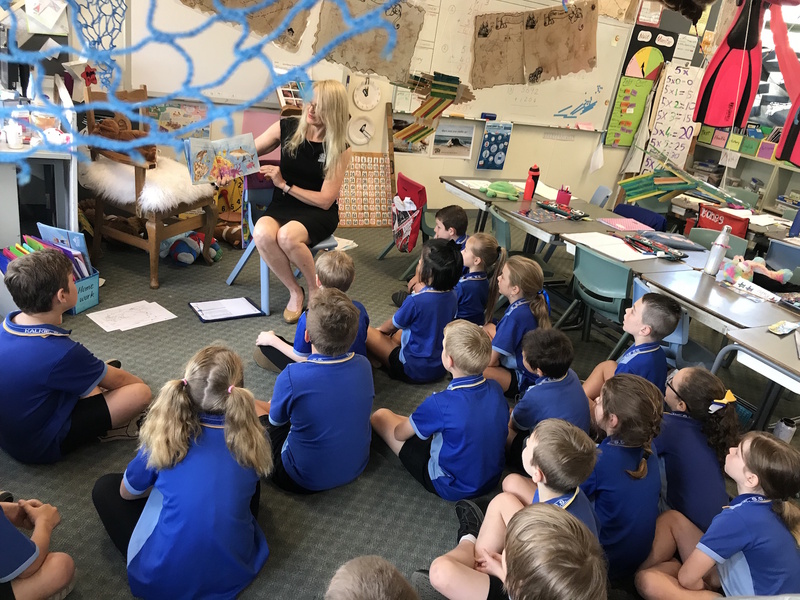 September 2018 – WORLD FIRST reading of my book by a teacher at Kalkie State School! 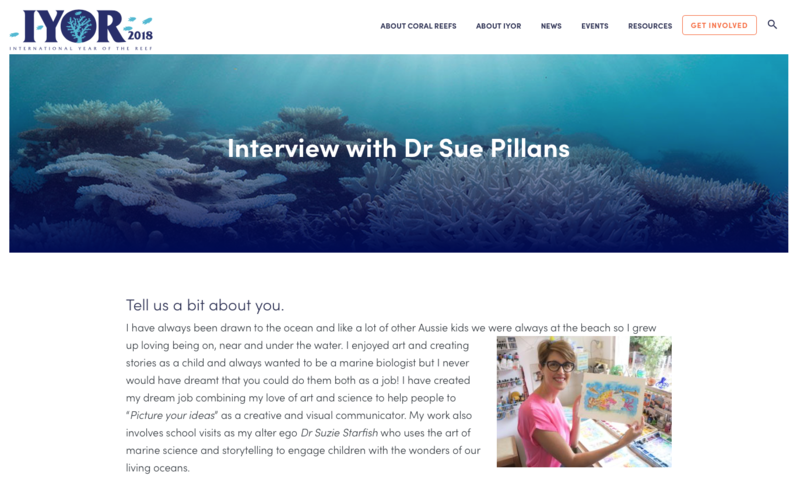 October 2018 – Thrilled to be interviewed by the International Year of the Reef about my new picture book and my ocean storytelling using ocean optimism! 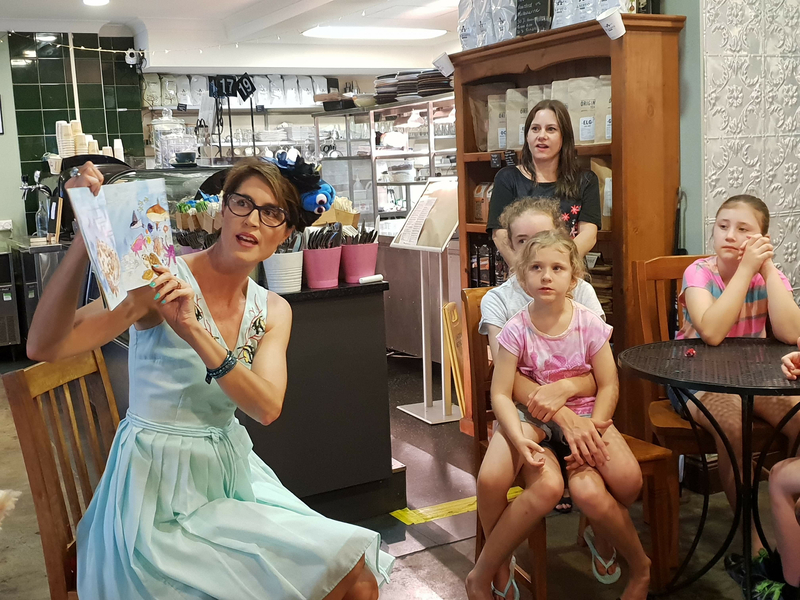 21st October 2018 – BOOK LAUNCH TIME! So great to ‘sea’ everyone! 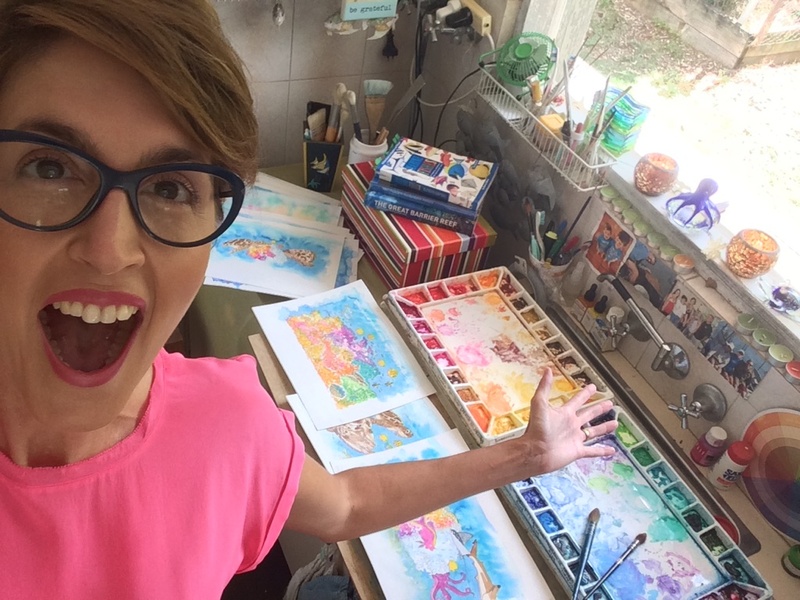 AND SO THANKFUL for all the support I’m receiving for my first children’s picture book! 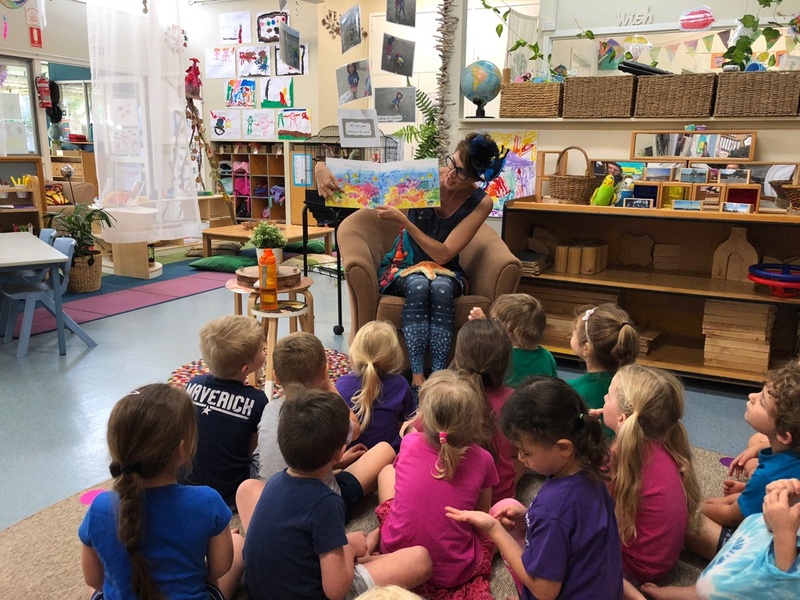 October 2018 – Story time at Kindy!! 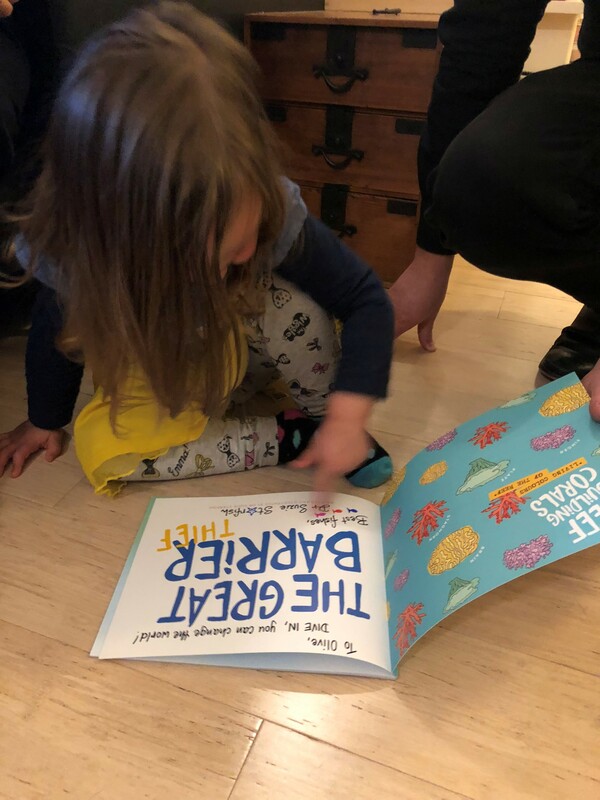 What a great time I had reading you my story, and thank you for your FIN-tastic feedback of my book!! 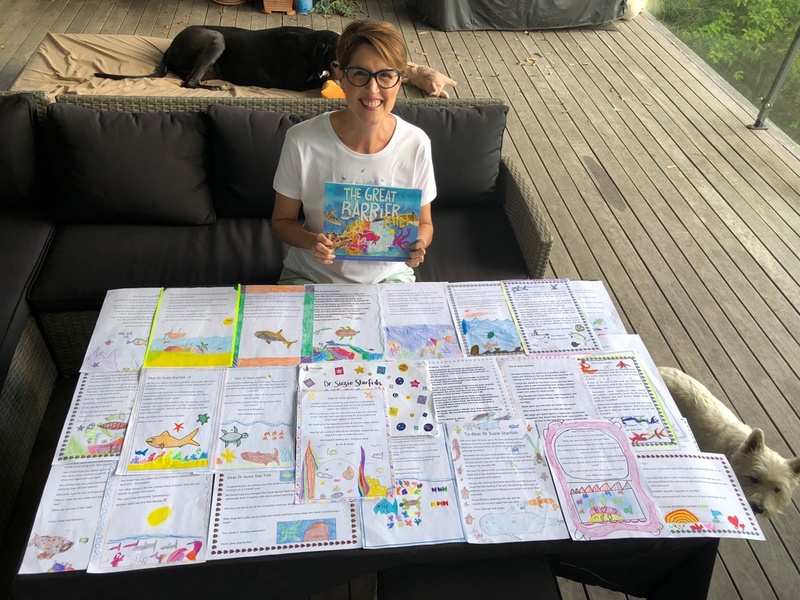 November 2018 – How touched I was to receive these heartfelt letters from 48 primary school students in remote Western Australia (Exmouth) about my book! 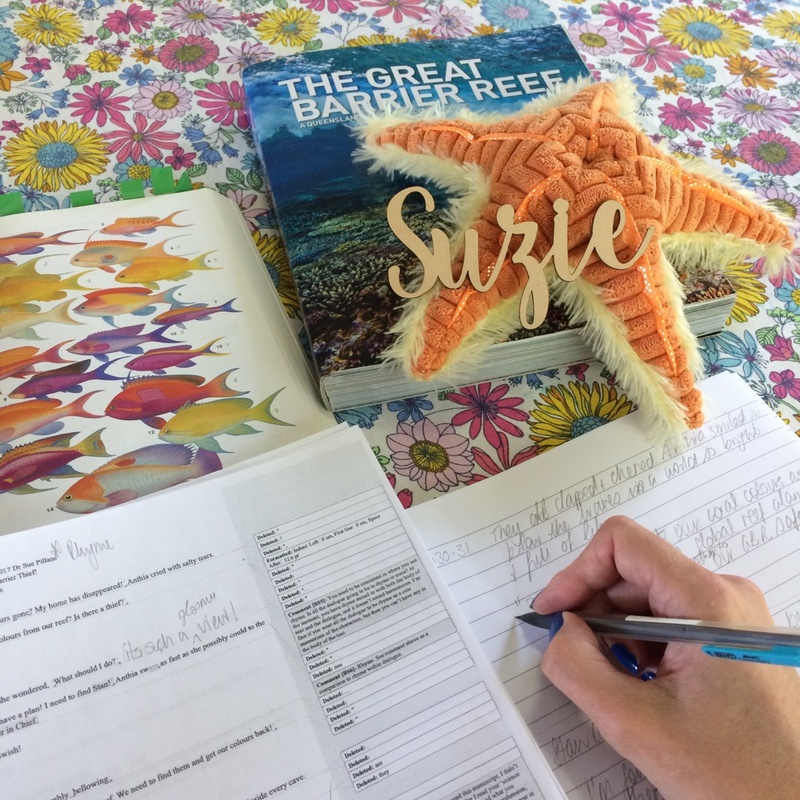 And just like Santa Dr Suzie Starfish always writes back! 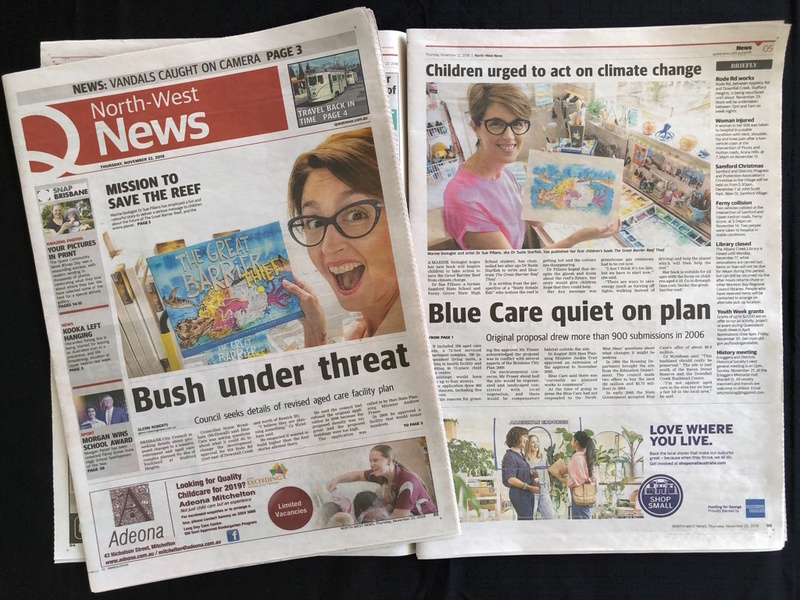 November 2018 – Always great to ‘sea’ my picture book making front page news! 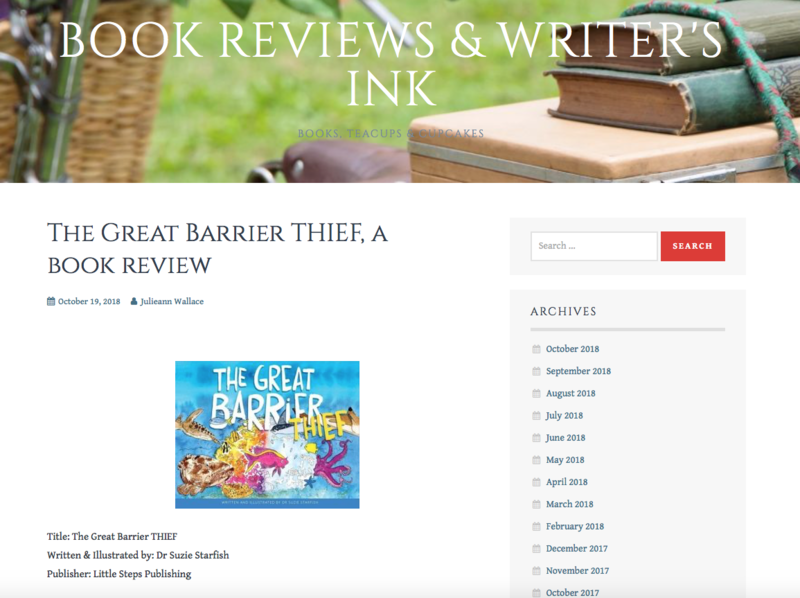 I’m so grateful for all the local support I am receiving as a local Aussie author/illustrator. We need to think global about climate change and act local! 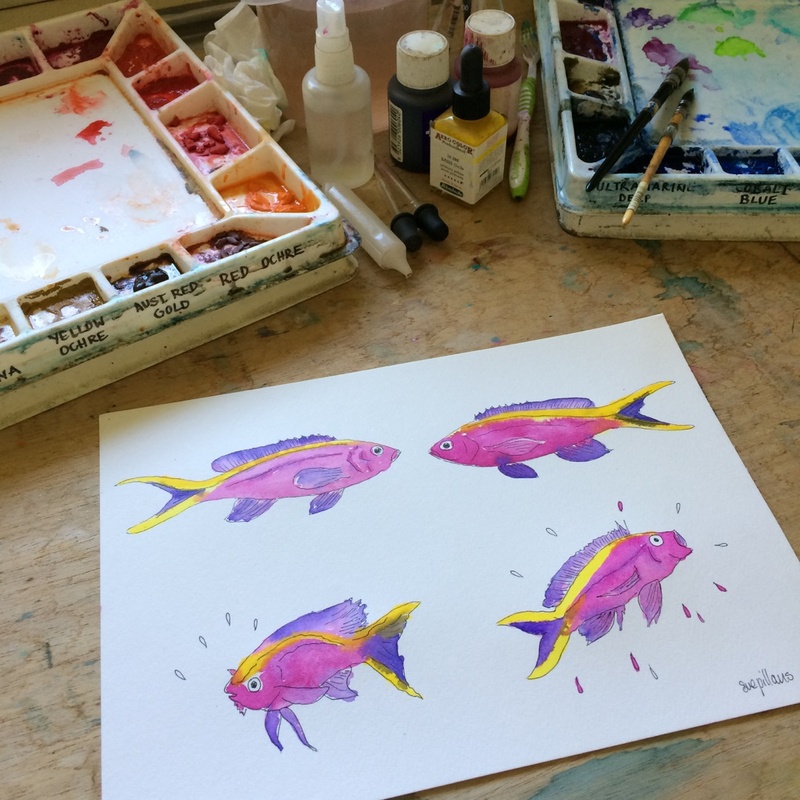 December 2018 – It’s beginning to look a lot like FISHmas! 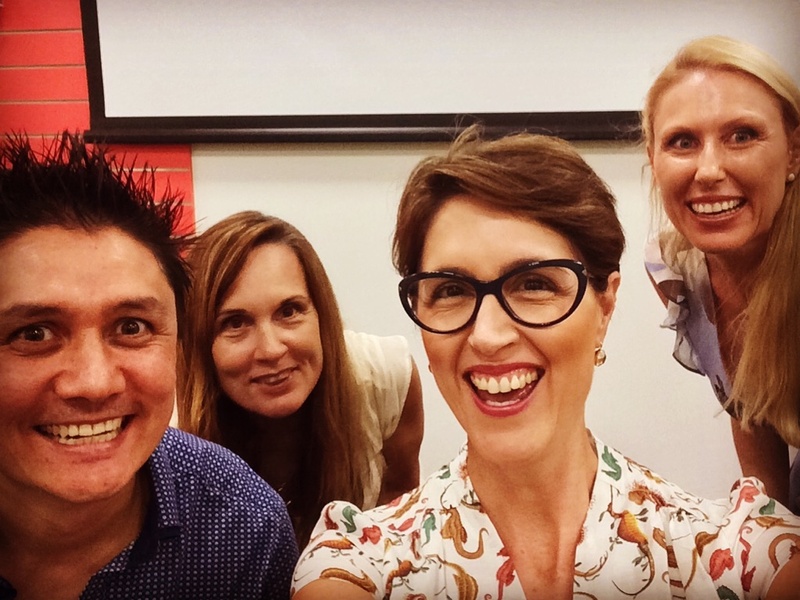 January 2019 – This year has started off so well for my book! 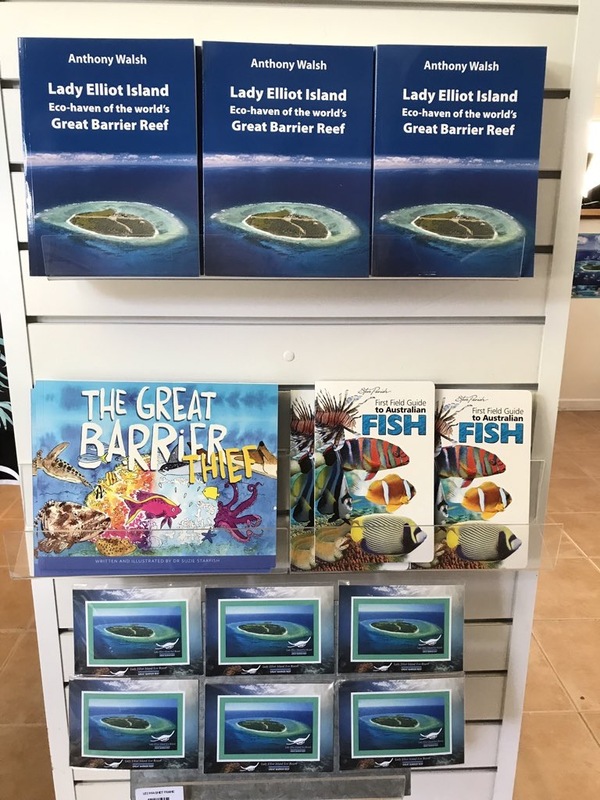 It’s SO GREAT to ‘sea’ my book now being sold (and seen) in airport newsagency’s across Australia, all the way up to Cooktown and a second shipment of my books is now diving into the Great Barrier Reef (on beautiful Lady Elliot Island)!! 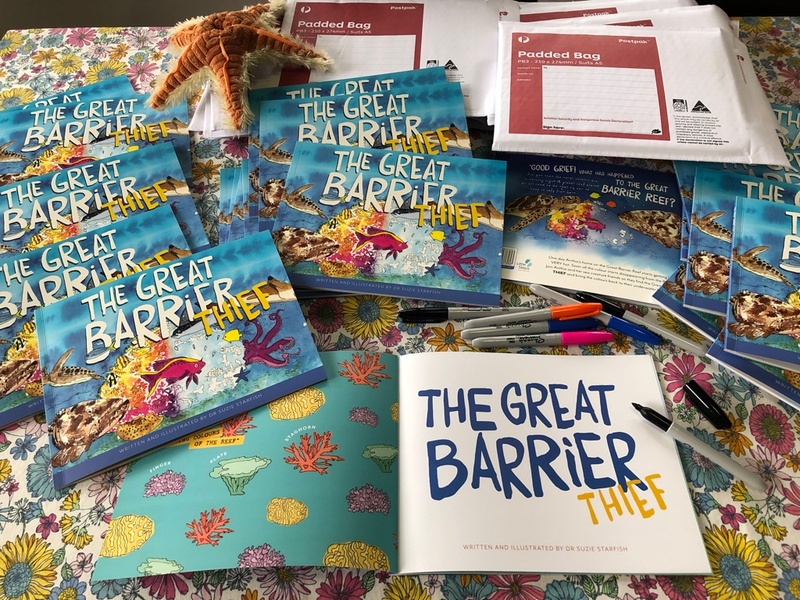 February 2019 – SO EXCITED to ‘sea’ my book about the Great Barrier Reef ON the Great Barrier Reef! 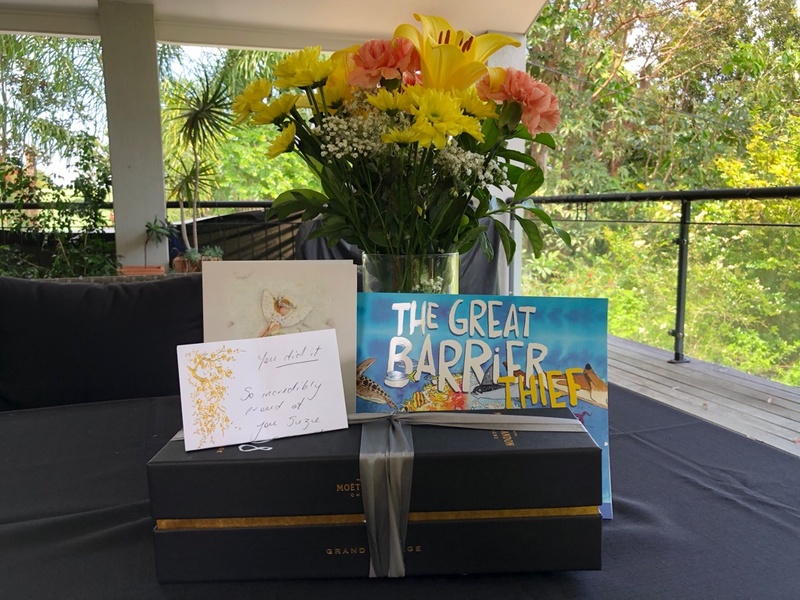 Thank you to Lady Elliot Island Eco Resort for diving into my book! 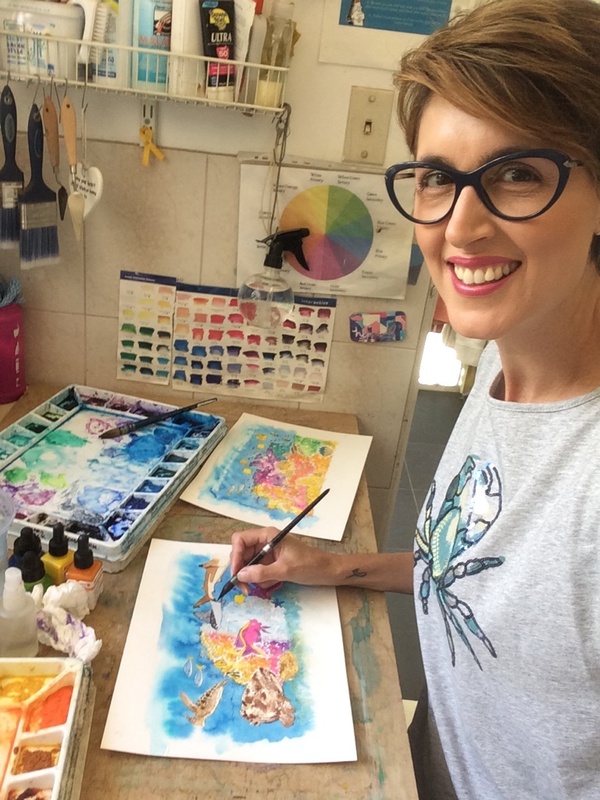 March 2019 – This is the lady that gave me the illustration inspiration to write and illustrate my picture book! 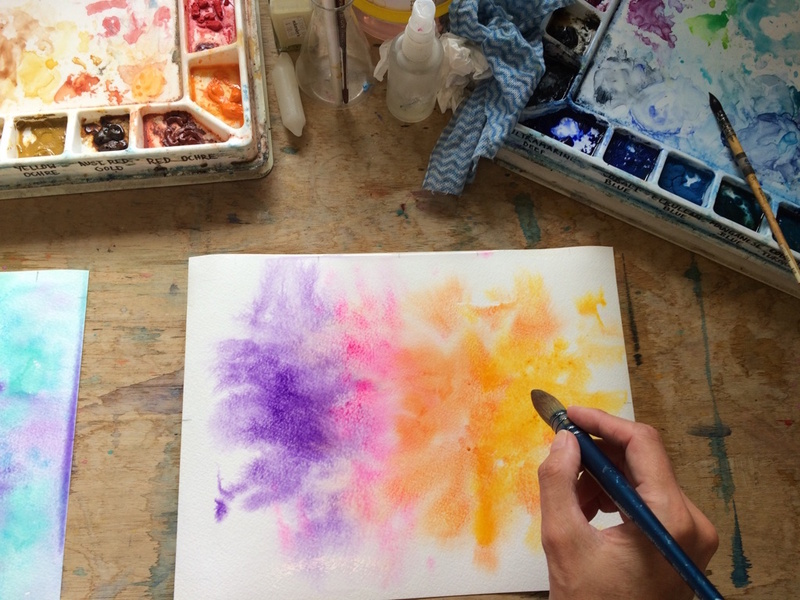 Thank you to Di Kelly, AMAZING ARTIST, for teaching me to live my life in colour! 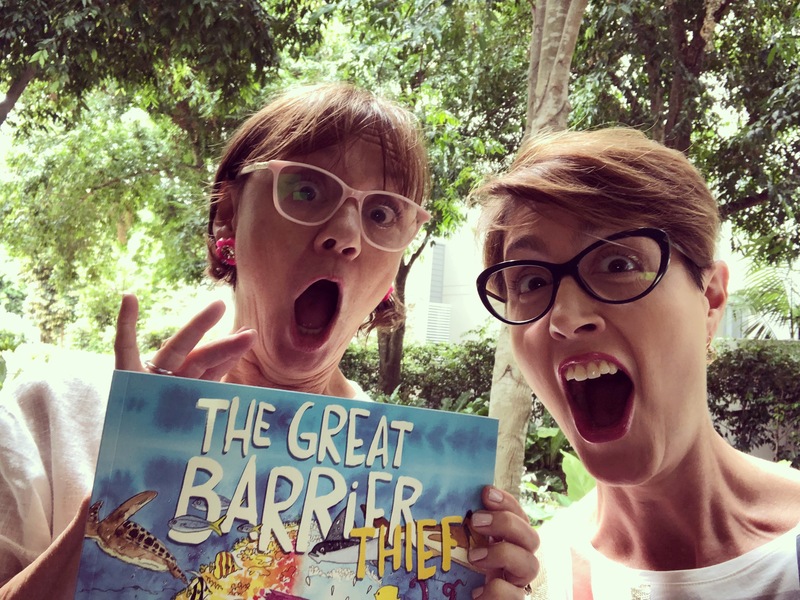 STAY TUNED here for further updates on my Author/Illustrator journey with The Great Barrier Thief and please contact me if you would like further information on school/kindy and library visits and author/illustrator events. 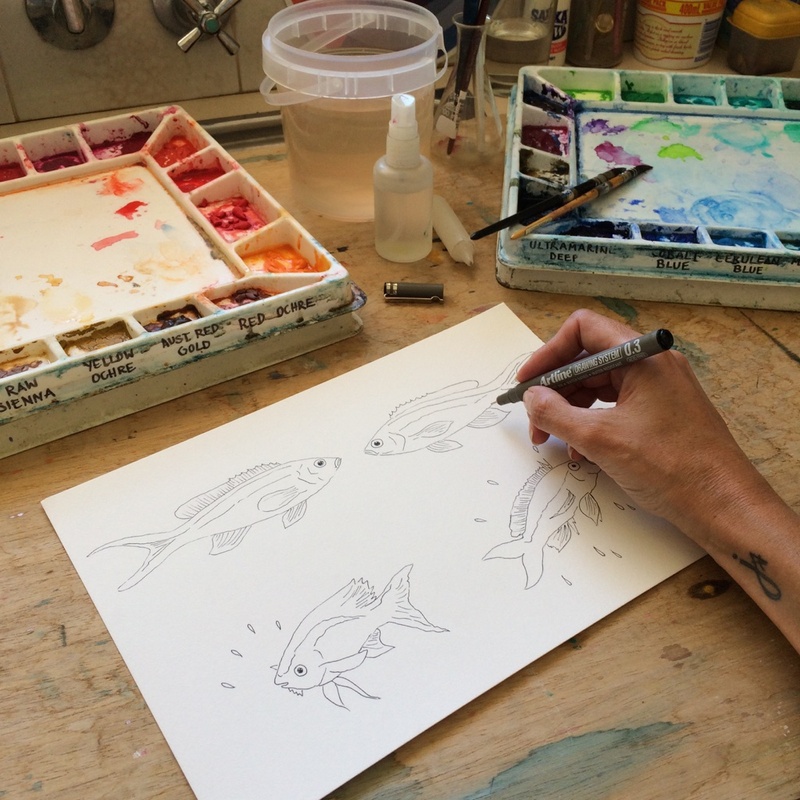 If you would like to know more about my ocean storytelling.